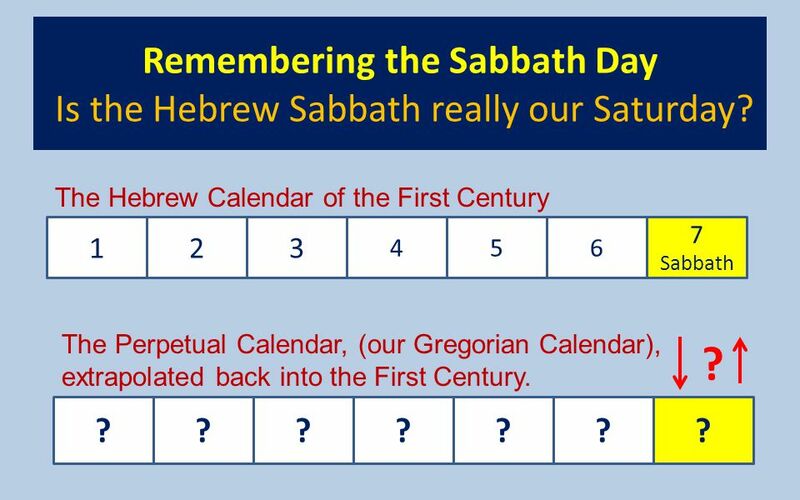 1 Remembering the Sabbath Day Is the Hebrew Sabbath really our Saturday? 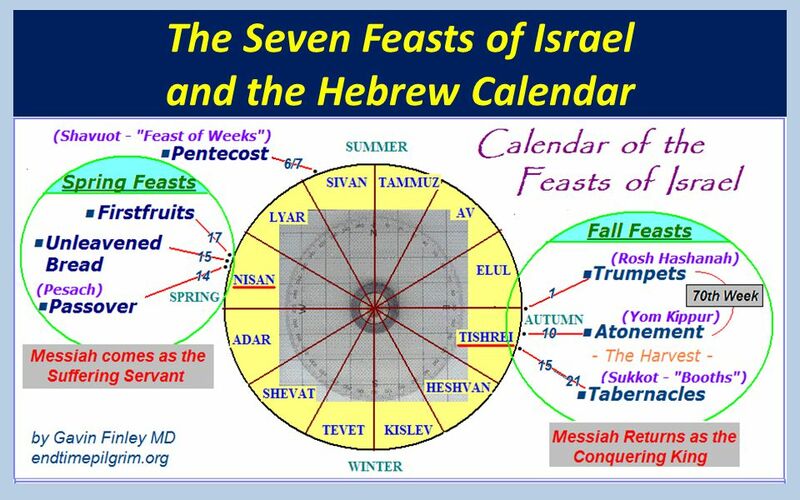 The Hebrew Calendar of the First Century 1 2 3 4 5 6 7 Sabbath The Perpetual Calendar, (our Gregorian Calendar), extrapolated back into the First Century. ? ? ? ? ? ? ? ? 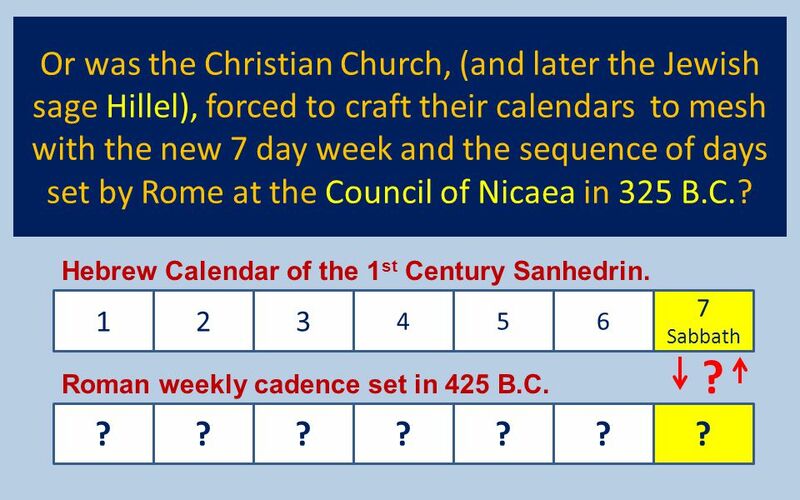 2 Or was the Christian Church, (and later the Jewish sage Hillel), forced to craft their calendars to mesh with the new 7 day week and the sequence of days set by Rome at the Council of Nicaea in 325 B.C.? 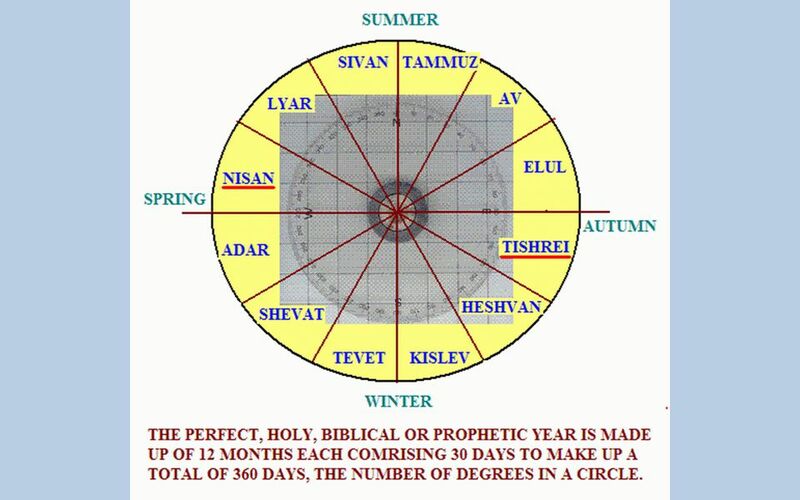 Hebrew Calendar of the 1st Century Sanhedrin. 1 2 3 4 5 6 7 Sabbath ? 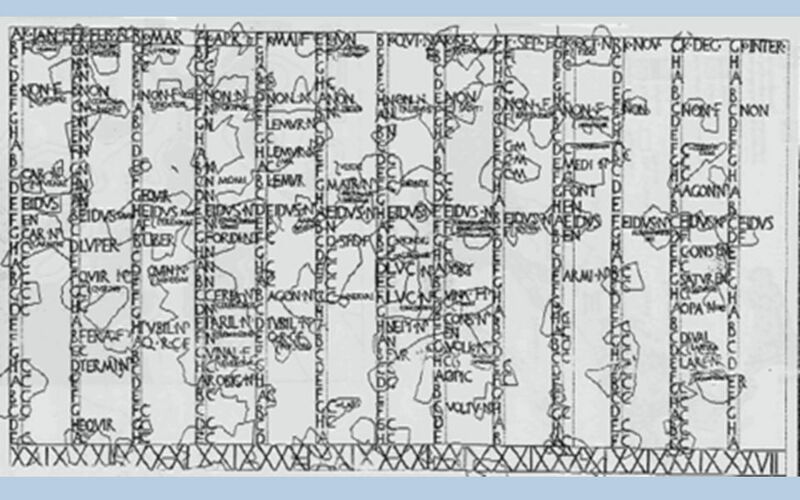 Roman weekly cadence set in 425 B.C. ? ? ? ? ? ? ? 4 of our court houses to promote the Judeo-Christian rule of law. 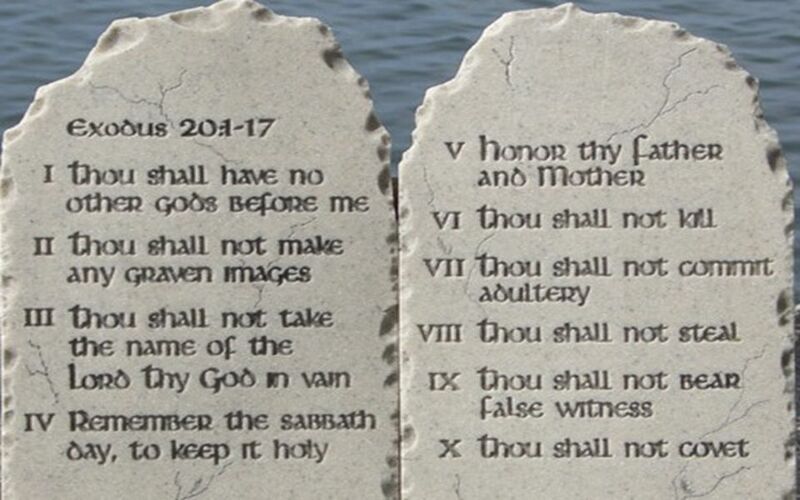 In the West we enshrine the ten commandments and seek to uphold Godly righteousness in our society. We seek to honor and keep these moral laws of the nation of Israel. 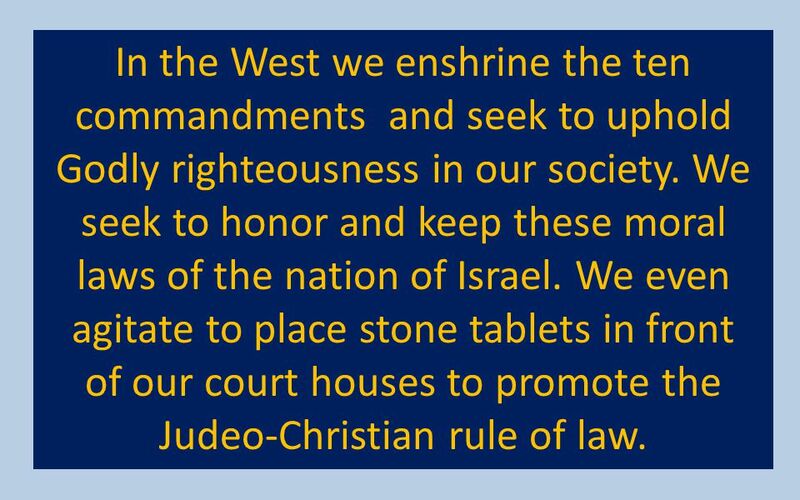 We even agitate to place stone tablets in front of our court houses to promote the Judeo-Christian rule of law. 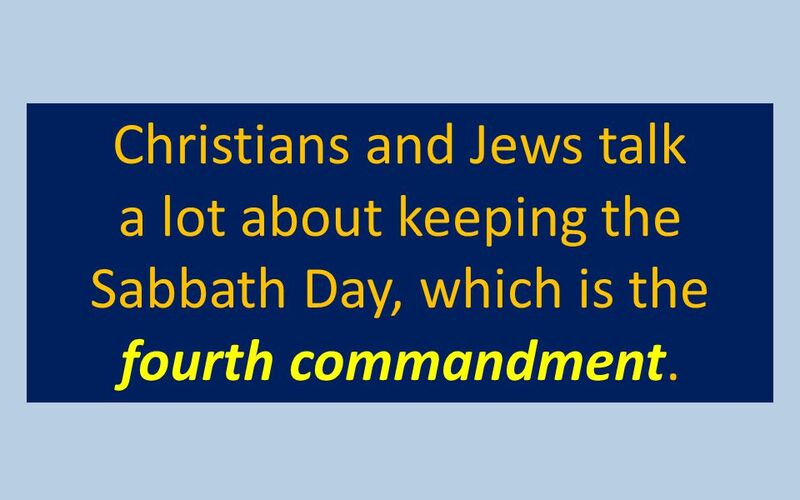 a lot about keeping the Sabbath Day, which is the fourth commandment. 7 IV. 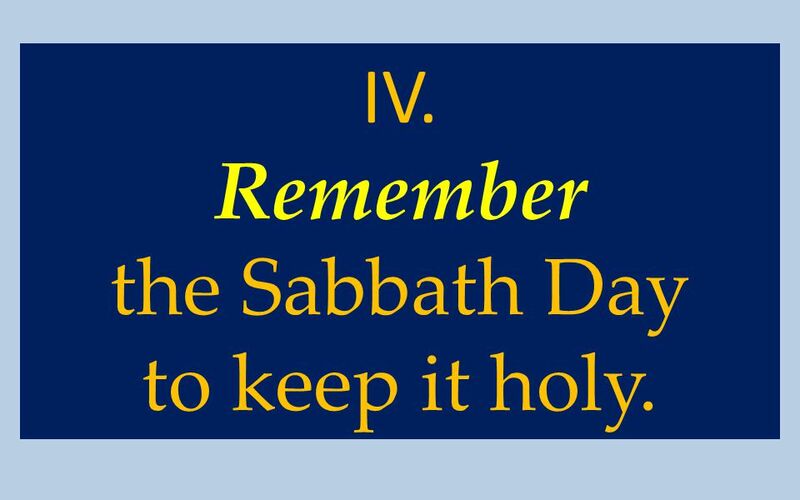 Remember the Sabbath Day to keep it holy. 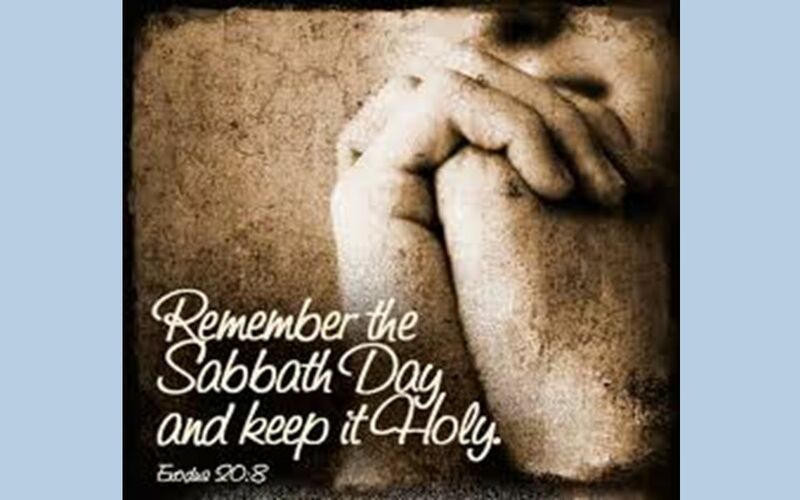 8 “keep the Sabbath Day holy”. 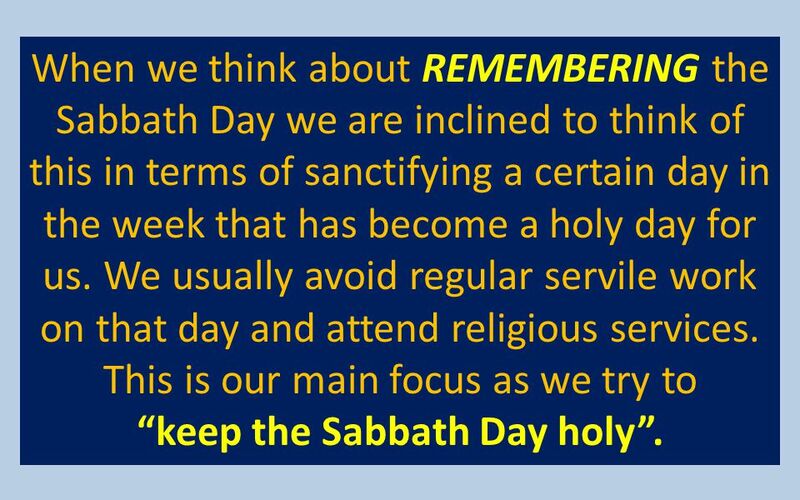 When we think about REMEMBERING the Sabbath Day we are inclined to think of this in terms of sanctifying a certain day in the week that has become a holy day for us. We usually avoid regular servile work on that day and attend religious services. This is our main focus as we try to “keep the Sabbath Day holy”. 9 Honoring the Sabbath on a certain day of the week. 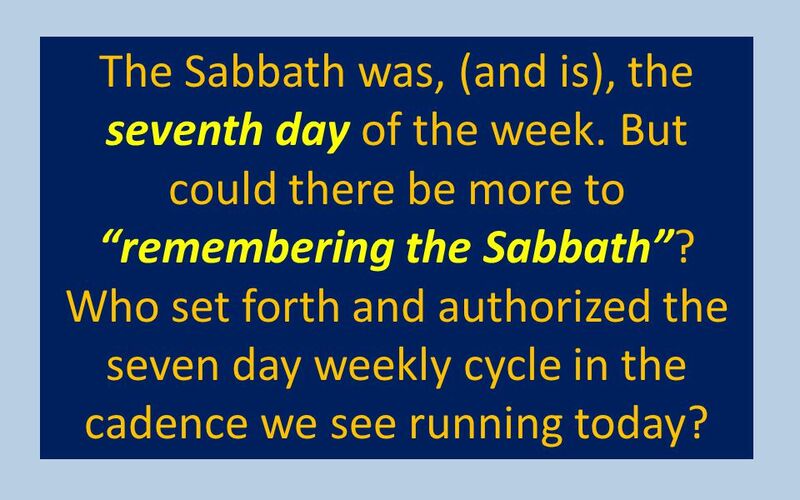 The Sabbath was, (and is), the seventh day of the week. But could there be more to “remembering the Sabbath”? 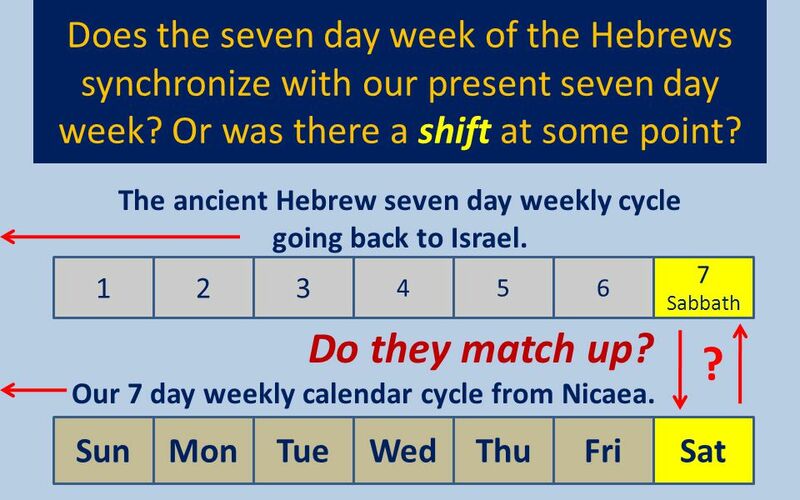 Who set forth and authorized the seven day weekly cycle in the cadence we see running today? 12 Here he is right here. Do we know this man? Well, we are going to find out. 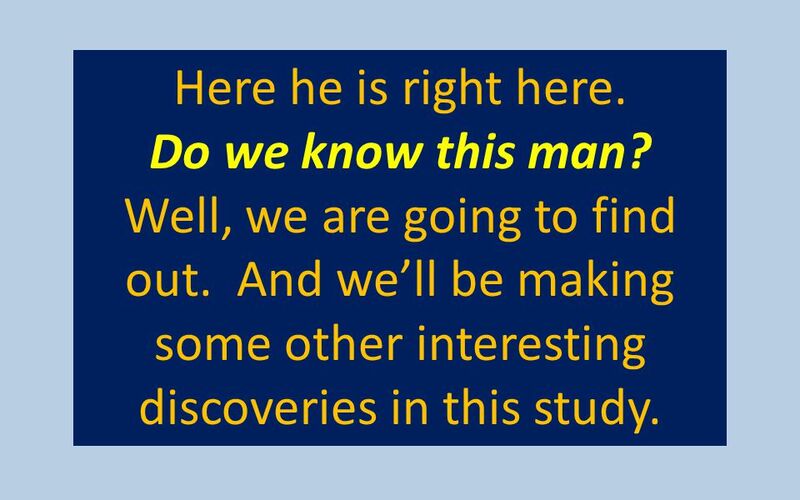 And we’ll be making some other interesting discoveries in this study. And so we come to the big question. 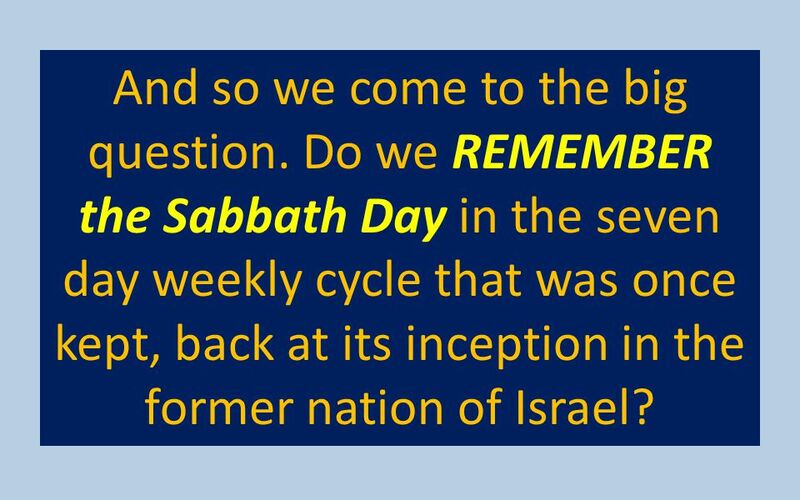 Do we REMEMBER the Sabbath Day in the seven day weekly cycle that was once kept, back at its inception in the former nation of Israel? 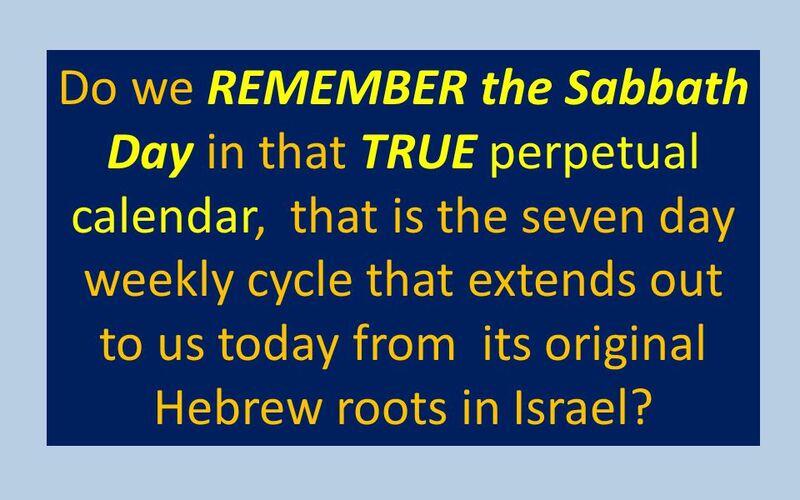 16 Do we REMEMBER the Sabbath Day in that TRUE perpetual calendar, that is the seven day weekly cycle that extends out to us today from its original Hebrew roots in Israel? 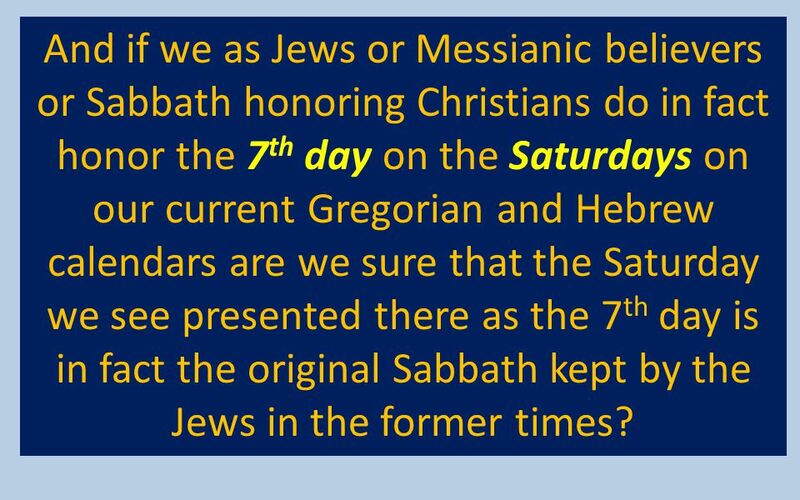 17 And if we as Jews or Messianic believers or Sabbath honoring Christians do in fact honor the 7th day on the Saturdays on our current Gregorian and Hebrew calendars are we sure that the Saturday we see presented there as the 7th day is in fact the original Sabbath kept by the Jews in the former times? 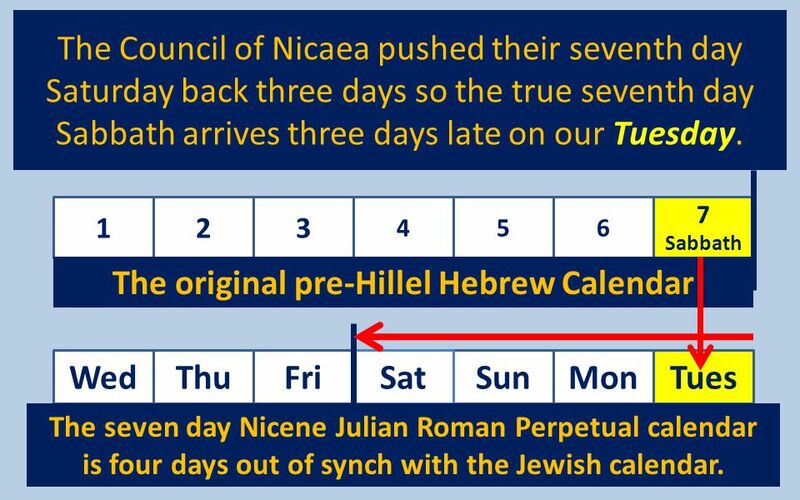 18 The 7 day week Roman calendar after Nicaea. 19 This has become an axiom, held as true by both Christians and Jews. 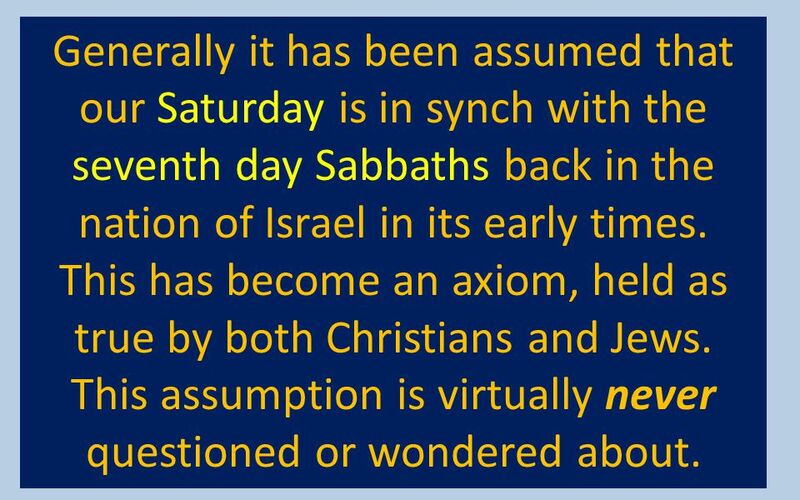 Generally it has been assumed that our Saturday is in synch with the seventh day Sabbaths back in the nation of Israel in its early times. This has become an axiom, held as true by both Christians and Jews. This assumption is virtually never questioned or wondered about. 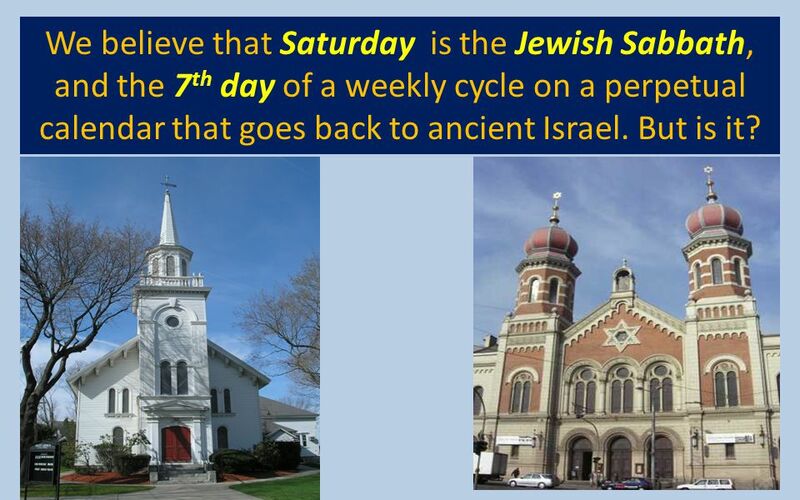 20 We believe that Saturday is the Jewish Sabbath, and the 7th day of a weekly cycle on a perpetual calendar that goes back to ancient Israel. But is it? 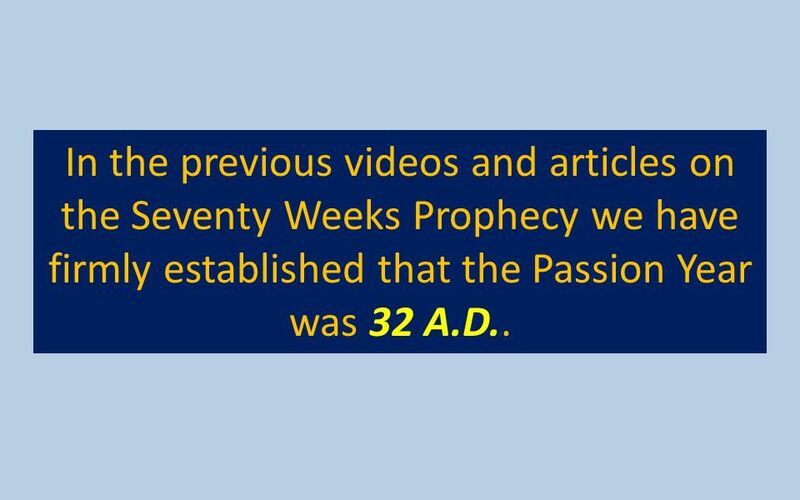 21 In the previous videos and articles on the Seventy Weeks Prophecy we have firmly established that the Passion Year was 32 A.D..
23 The Gospel accounts give us enough information to place some of the key events of Passion Week on certain special dates on the Hebrew calendar. 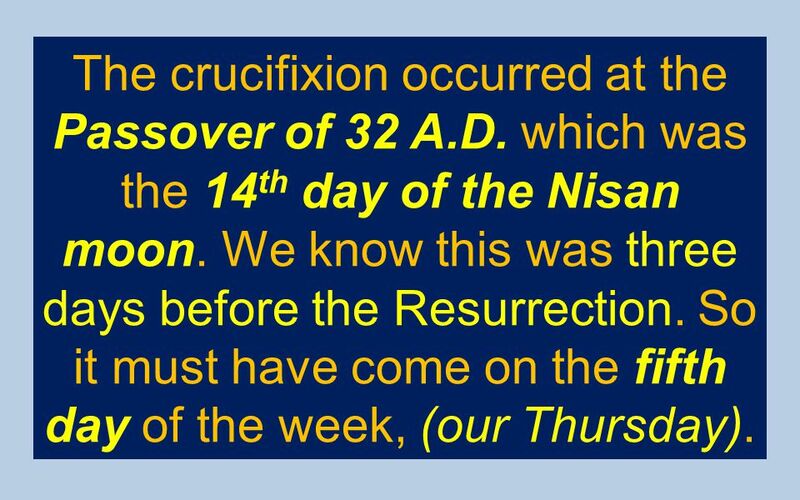 24 Nisan 14, 32 A.D.
25 The Gospel accounts also tell us of a certain key event of Passion Week that unfolded on a certain weekday. out the Hebrew calendar and Passion Week alongside the (perpetual) Julian/Gregorian calendar. 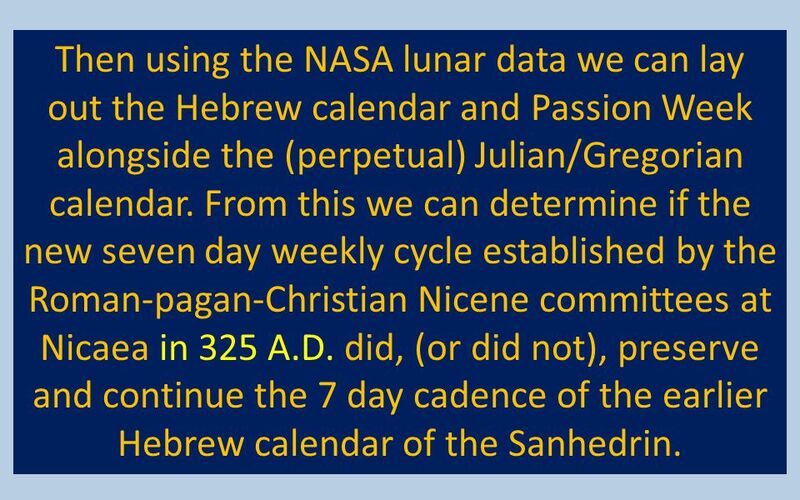 From this we can determine if the new seven day weekly cycle established by the Roman-pagan-Christian Nicene committees at Nicaea in 325 A.D. did, (or did not), preserve and continue the 7 day cadence of the earlier Hebrew calendar of the Sanhedrin. 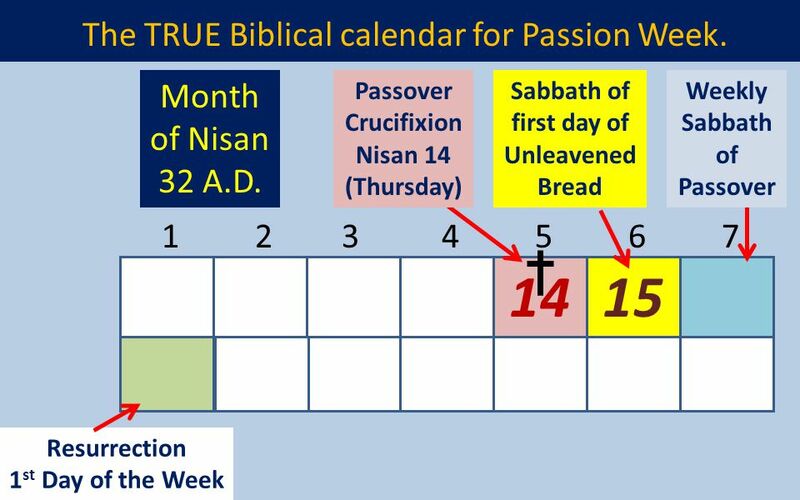 28 The two Biblical calendars for Passion Week, 32 A.D..
Weekly Sabbath of Passover Hebrew Month of Nisan, 32 A.D. 1 2 3 4 5 6 7 Julian Month of April, 32 A.D. ? ? 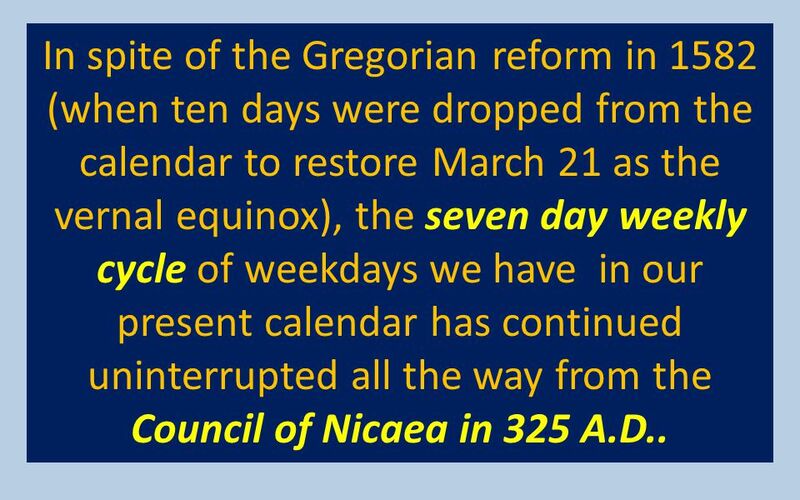 29 In spite of the Gregorian reform in 1582 (when ten days were dropped from the calendar to restore March 21 as the vernal equinox), the seven day weekly cycle of weekdays we have in our present calendar has continued uninterrupted all the way from the Council of Nicaea in 325 A.D..
Julian calendar is switched from an 8 day week to a 7 day week. 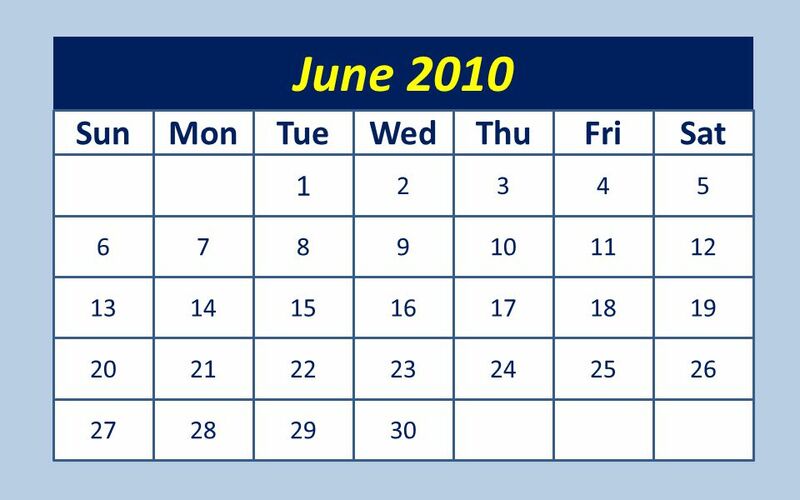 31 At that time the council changed the calendar from an 8 day week to a 7 day week. So we can know for a certainty that the seven day weekly cadence we have today was initially crafted in Byzantium. If there is a disconnect we can be fairly certain that it happened here at the Nicaean Council. 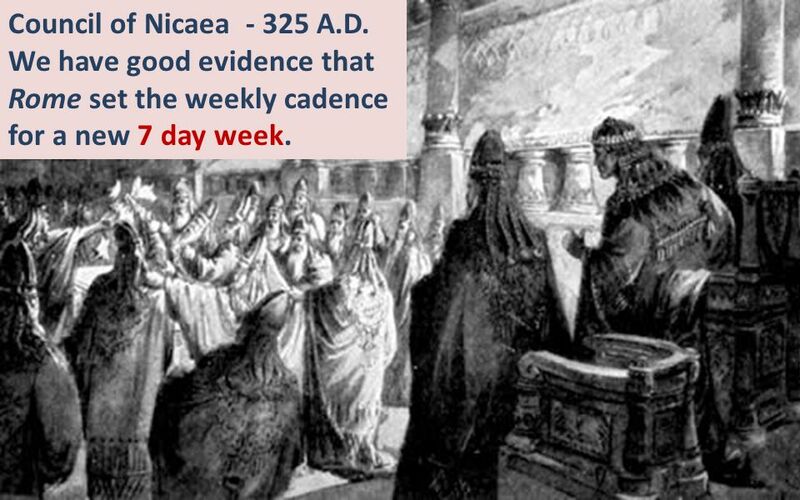 32 Council of Nicaea A.D. We have good evidence that Rome set the weekly cadence for a new 7 day week. 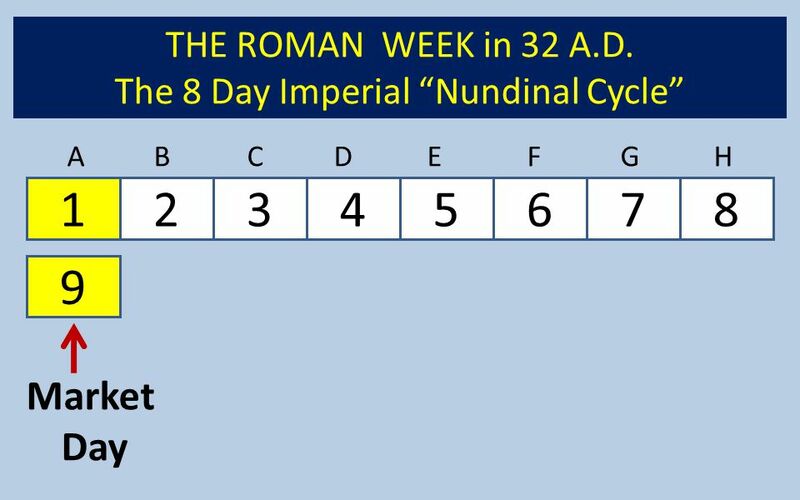 33 Our next task is to run this Roman solar calendar with its new seven day weekly cycle, back as a perpetual calendar into the first century. Then we can see if it meshes with the weekdays the Holy Scriptures lay out for us for the significant events of Passion Week. 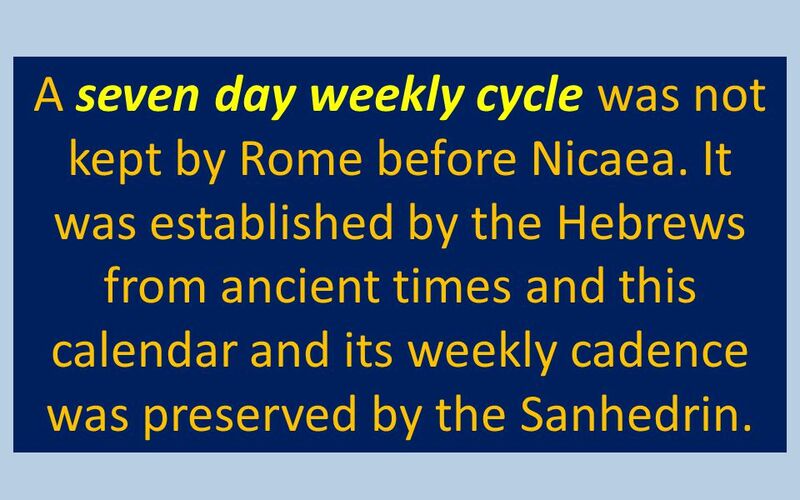 A seven day weekly cycle was not kept by Rome before Nicaea. It was established by the Hebrews from ancient times and this calendar and its weekly cadence was preserved by the Sanhedrin. 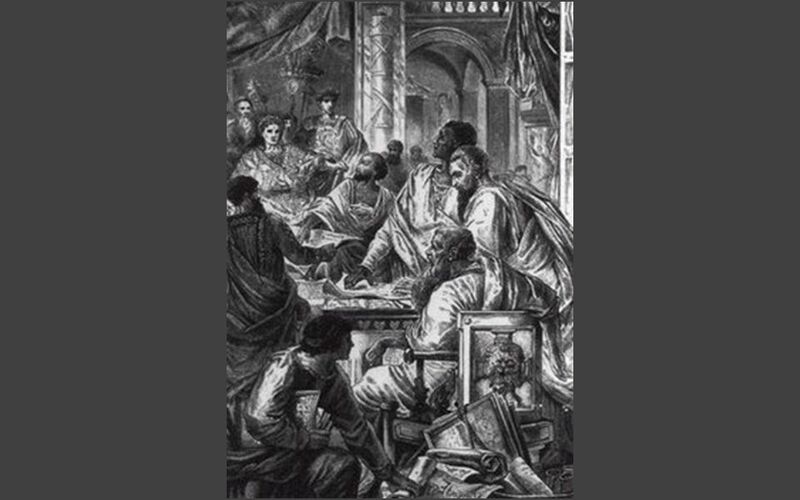 After the destruction of Jerusalem by Rome in 70 A.D. and during the first centuries of the Diaspora meetings of the Sanhedrin were outlawed. 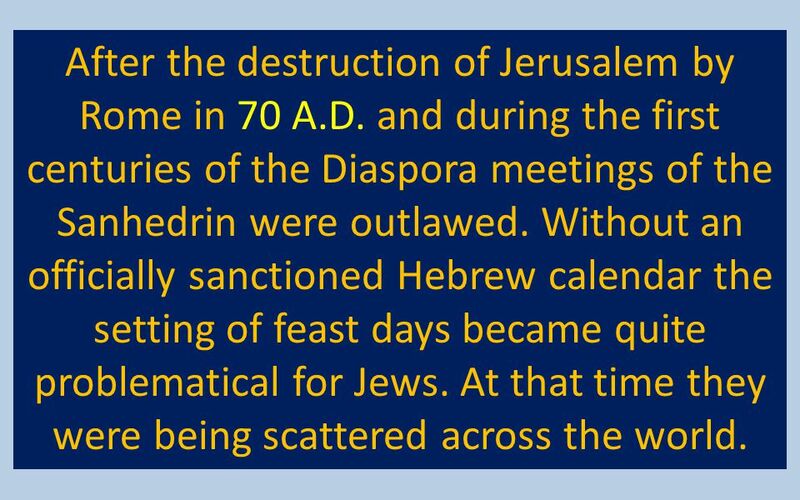 Without an officially sanctioned Hebrew calendar the setting of feast days became quite problematical for Jews. At that time they were being scattered across the world. by the Roman legions. 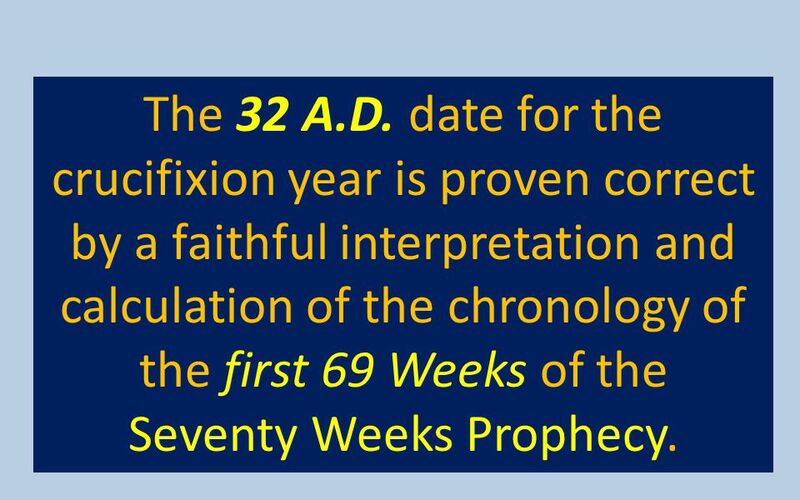 70 A.D.
39 But the first Century Hebrew calendar is not lost to us. 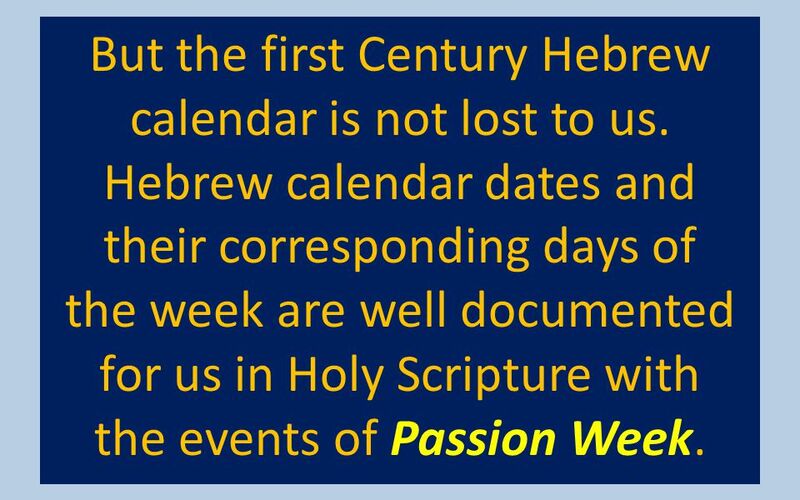 Hebrew calendar dates and their corresponding days of the week are well documented for us in Holy Scripture with the events of Passion Week. 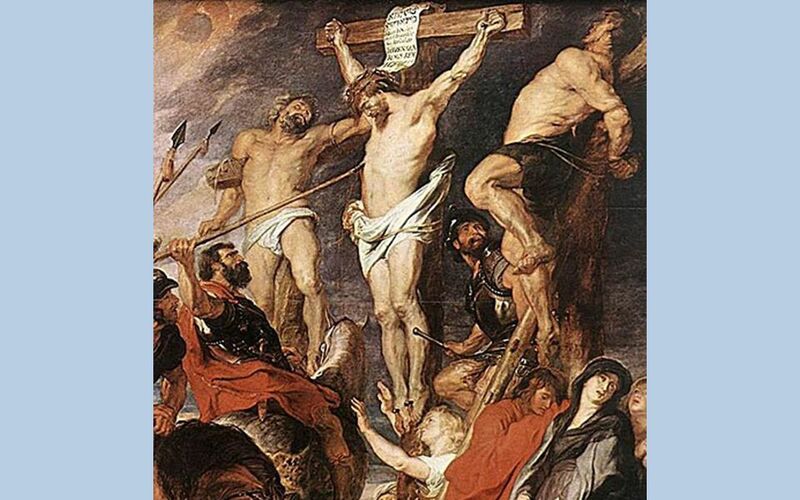 40 Crucified on Passover. 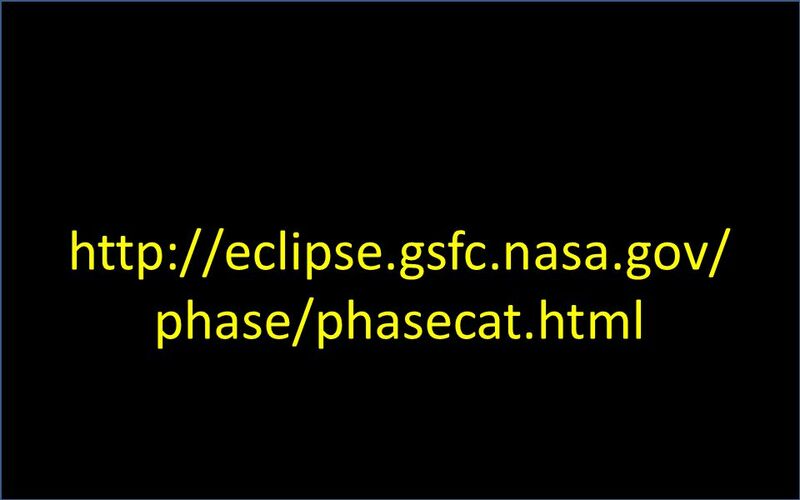 Nisan 14, 32 A.D.
41 And the lunar moon-phase data, specifically new moon dates and times going back 4,000 years are available online and accessible from this NASA website. 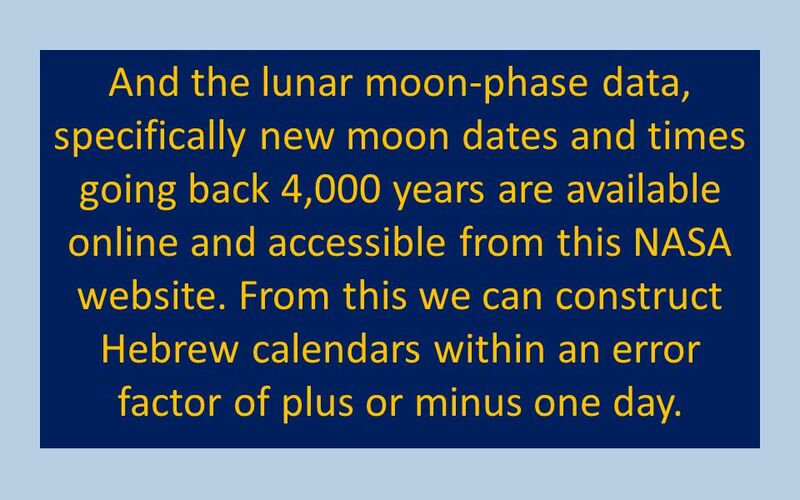 From this we can construct Hebrew calendars within an error factor of plus or minus one day. 43 At this point it is important to know that the Romans and their Julian calendar did not lay out a seven day week. They had an 8 day week. 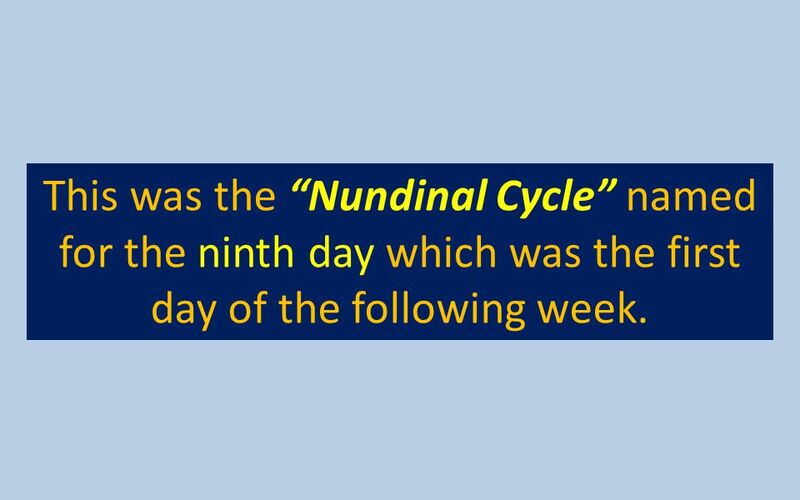 It was called the “Nundinal Cycle”. Here is an actual calendar from that era with the 8 days of the week marked A to H. We shall share more on this later. 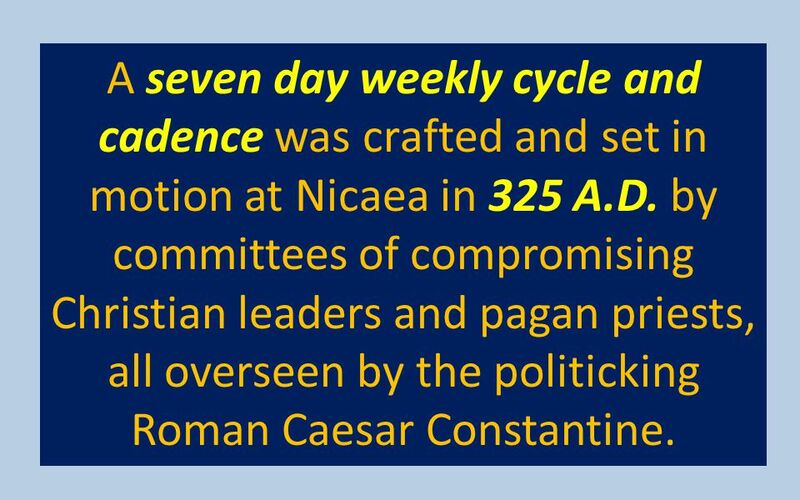 45 A seven day weekly cycle and cadence was crafted and set in motion at Nicaea in 325 A.D. by committees of compromising Christian leaders and pagan priests, all overseen by the politicking Roman Caesar Constantine. 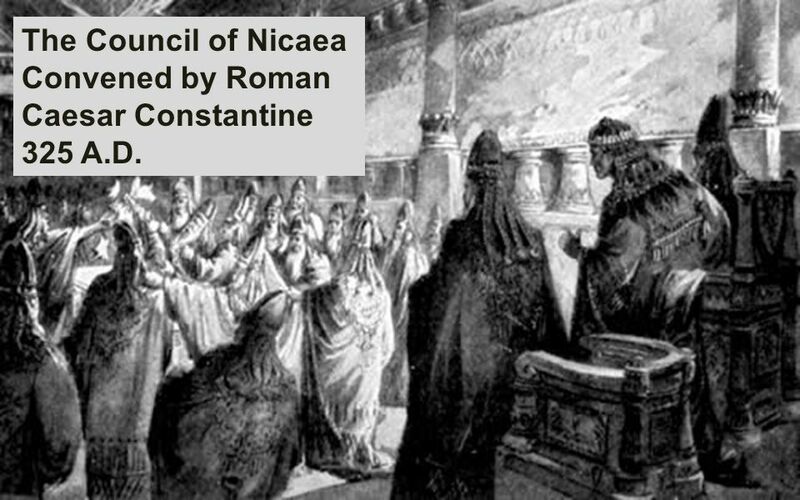 46 The Council of Nicaea Convened by Roman Caesar Constantine 325 A.D.
47 Now the big question. 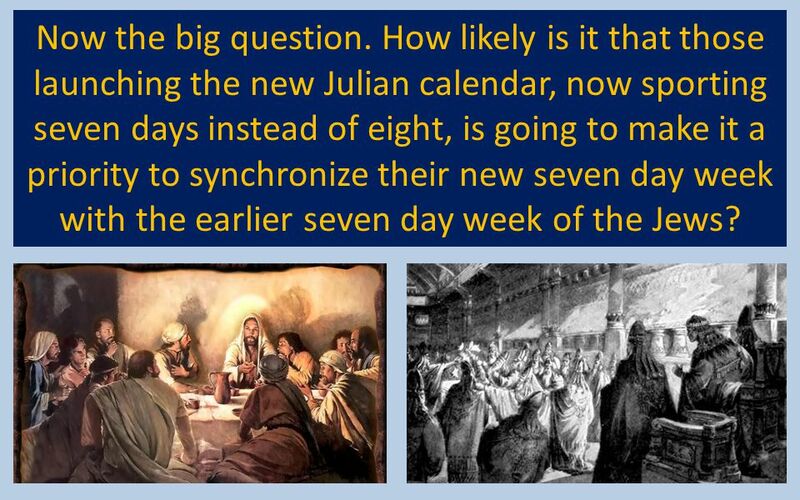 How likely is it that those launching the new Julian calendar, now sporting seven days instead of eight, is going to make it a priority to synchronize their new seven day week with the earlier seven day week of the Jews? We’ll leave that question for you to ponder and to answer later. 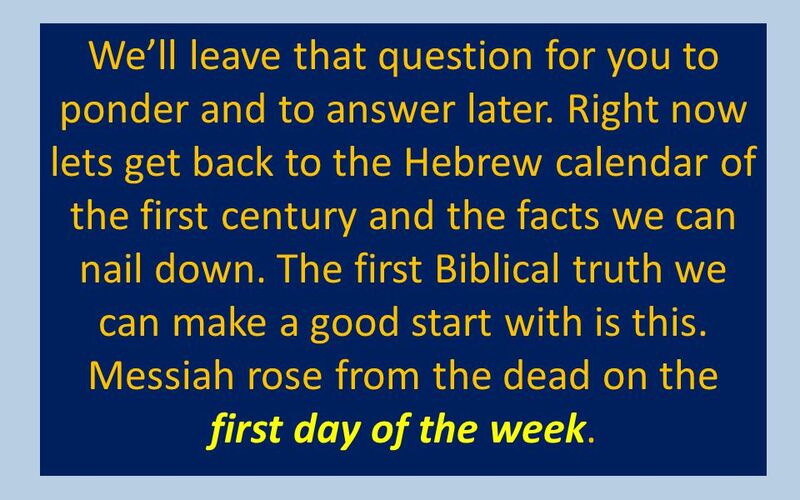 Right now lets get back to the Hebrew calendar of the first century and the facts we can nail down. 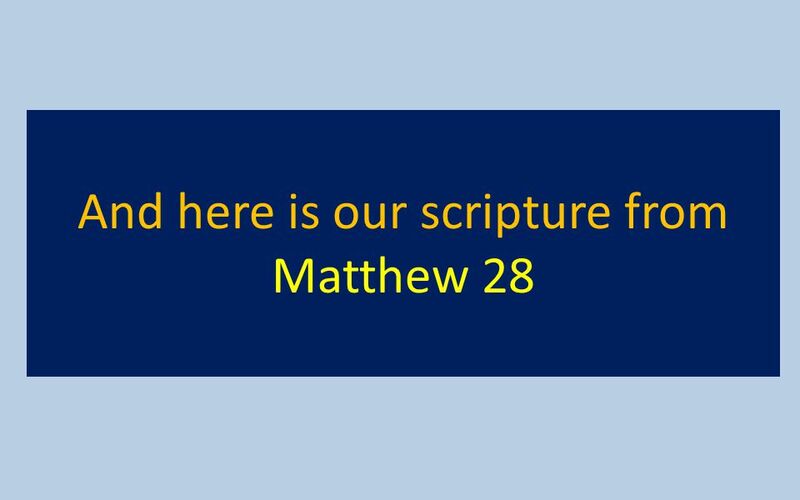 The first Biblical truth we can make a good start with is this. Messiah rose from the dead on the first day of the week. 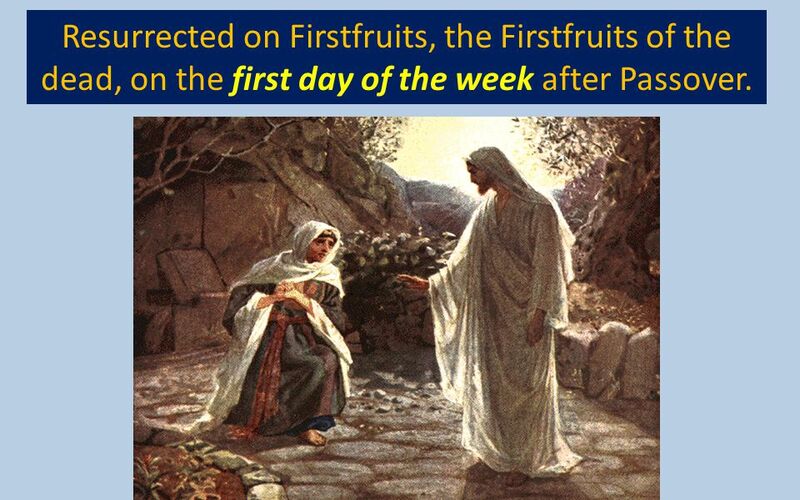 49 Resurrected on Firstfruits, the Firstfruits of the dead, on the first day of the week after Passover. 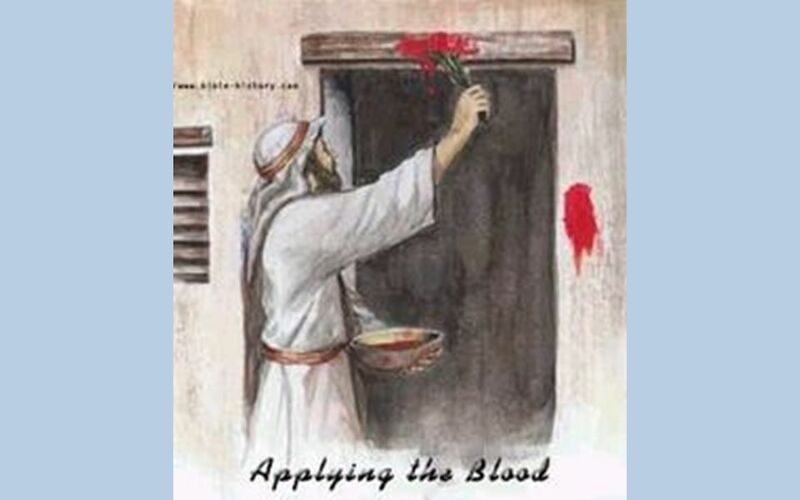 first day of the week following the Passover. 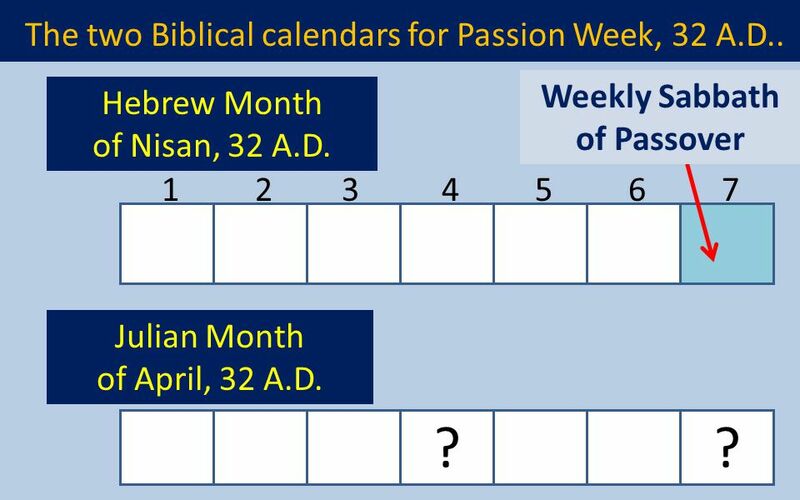 53 The true Biblical calendar for Passion Week. 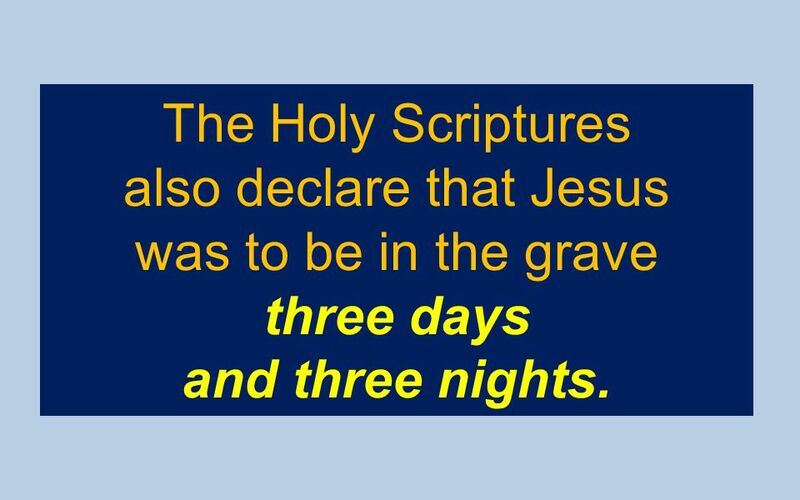 The Holy Scriptures also declare that Jesus was to be in the grave three days and three nights. Jonah 1:17 Now the LORD had prepared a great fish to swallow Jonah. 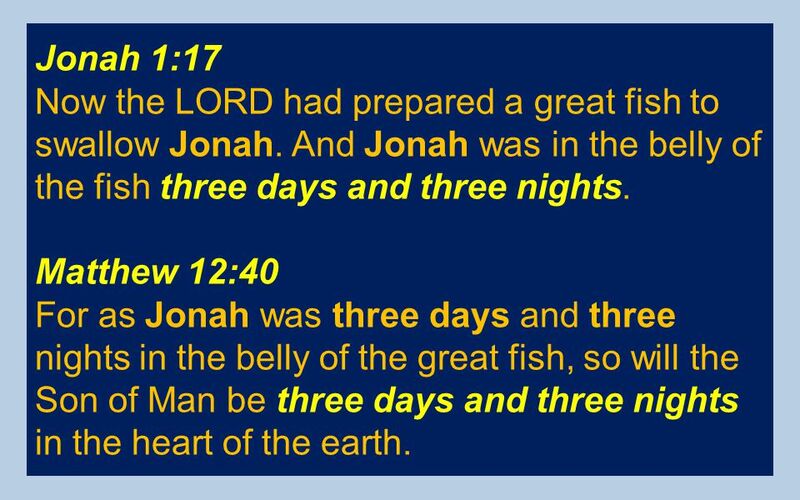 And Jonah was in the belly of the fish three days and three nights. 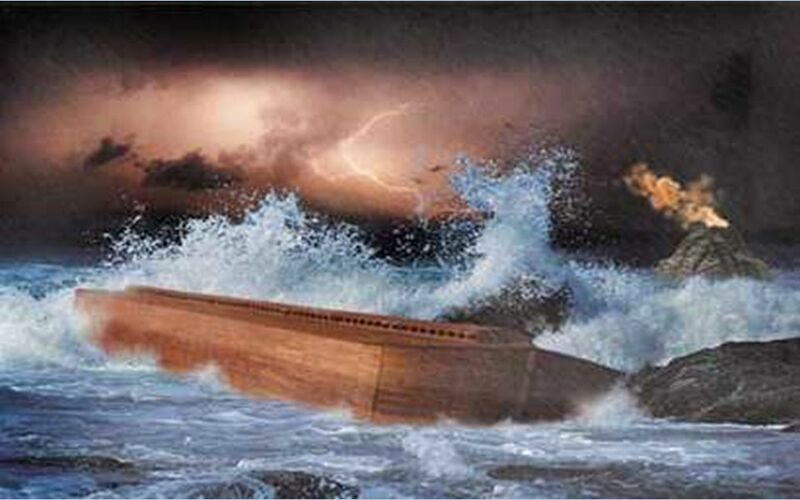 Matthew 12:40 For as Jonah was three days and three nights in the belly of the great fish, so will the Son of Man be three days and three nights in the heart of the earth. 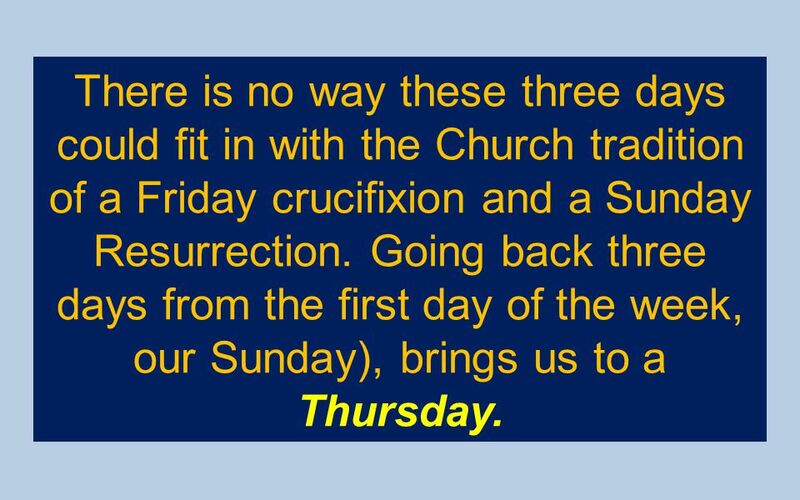 56 There is no way these three days could fit in with the Church tradition of a Friday crucifixion and a Sunday Resurrection. Going back three days from the first day of the week, our Sunday), brings us to a Thursday. 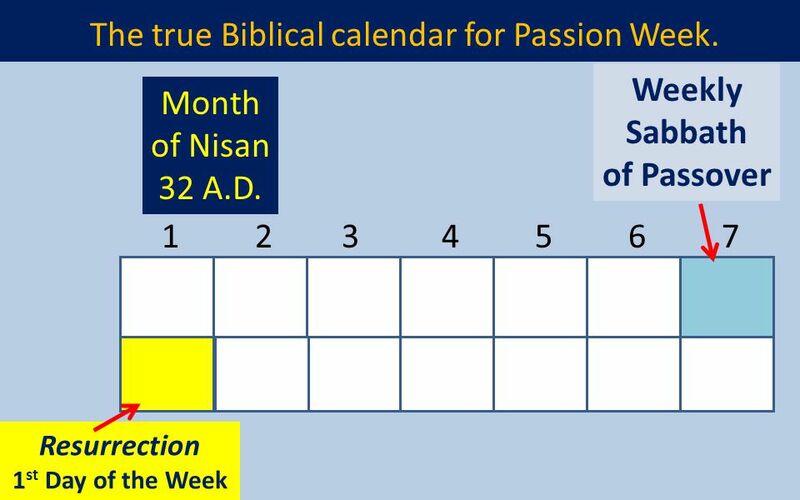 57 The true Biblical calendar for Passion Week. 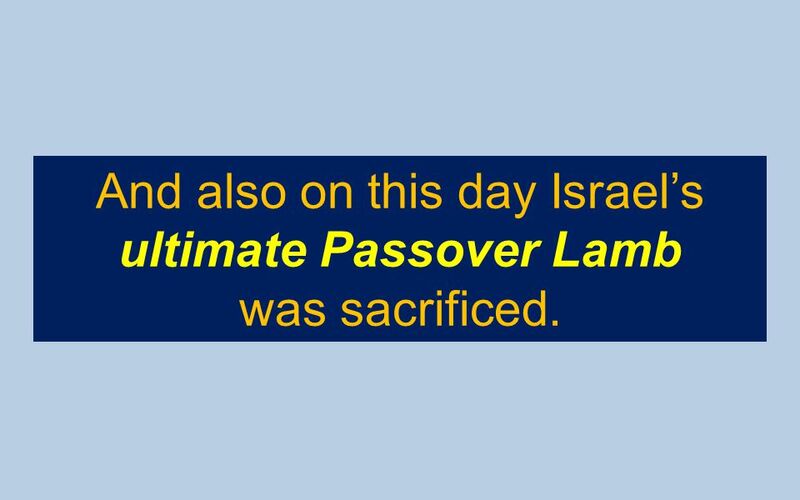 58 This was the day of the Passover, the day the sacrifice lambs were to be slain was set forth at Sinai. 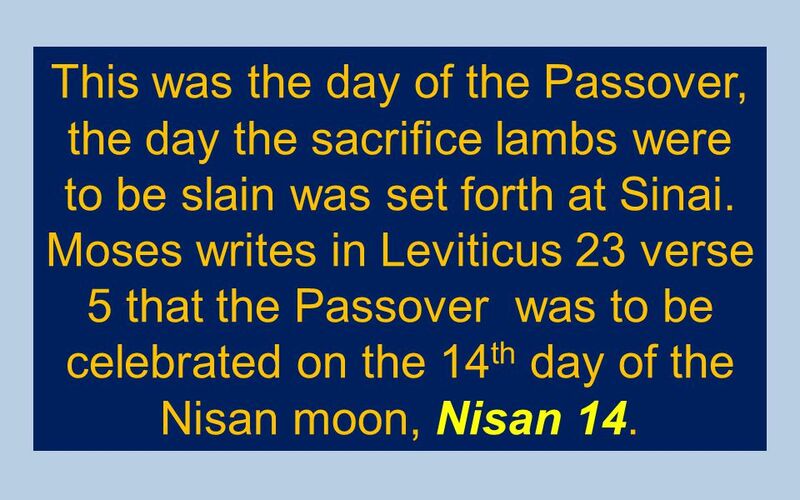 Moses writes in Leviticus 23 verse 5 that the Passover was to be celebrated on the 14th day of the Nisan moon, Nisan 14. 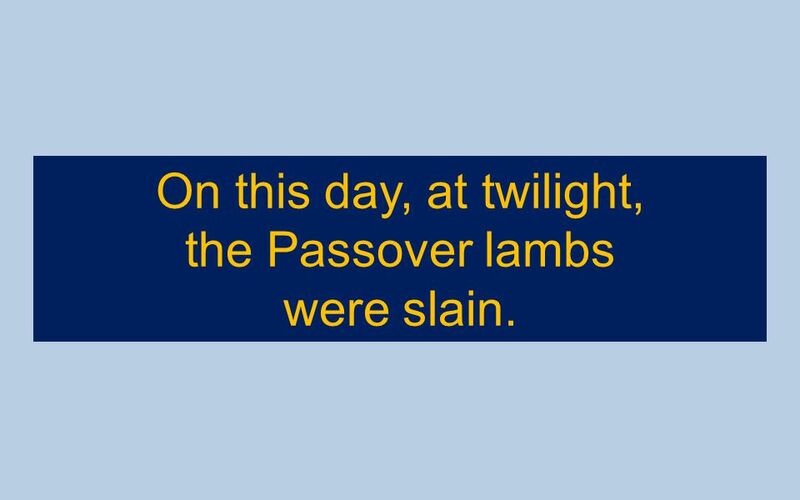 60 On this day, at twilight, the Passover lambs were slain. 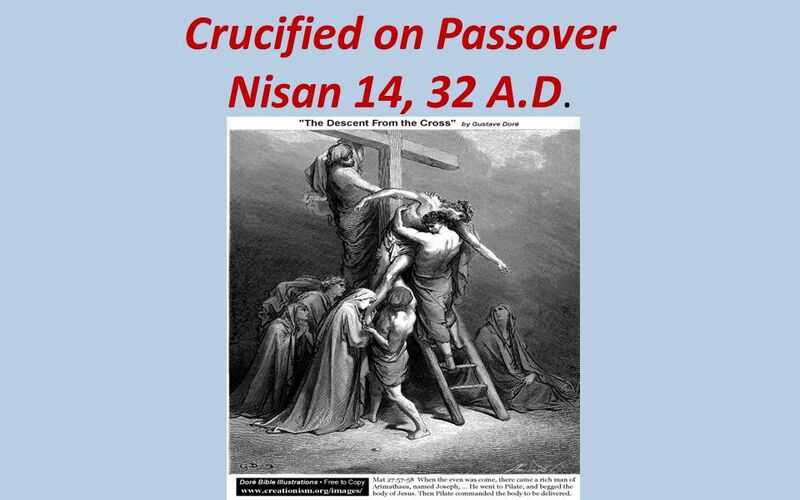 63 Crucified on Passover Nisan 14, 32 A.D. 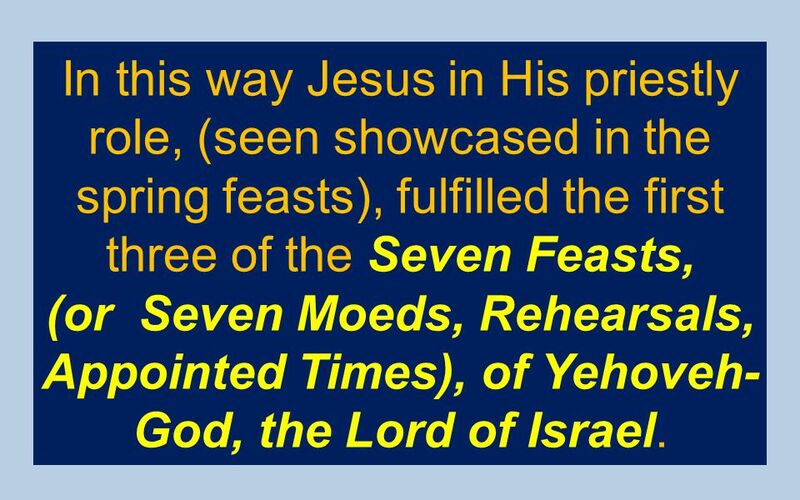 In this way Jesus in His priestly role, (seen showcased in the spring feasts), fulfilled the first three of the Seven Feasts, (or Seven Moeds, Rehearsals, Appointed Times), of Yehoveh-God, the Lord of Israel. 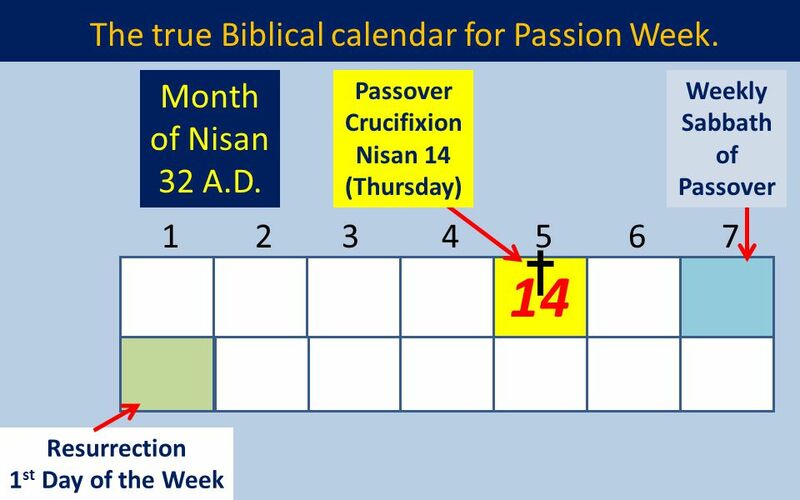 The crucifixion occurred at the Passover of 32 A.D. which was the 14th day of the Nisan moon. We know this was three days before the Resurrection. So it must have come on the fifth day of the week, (our Thursday). 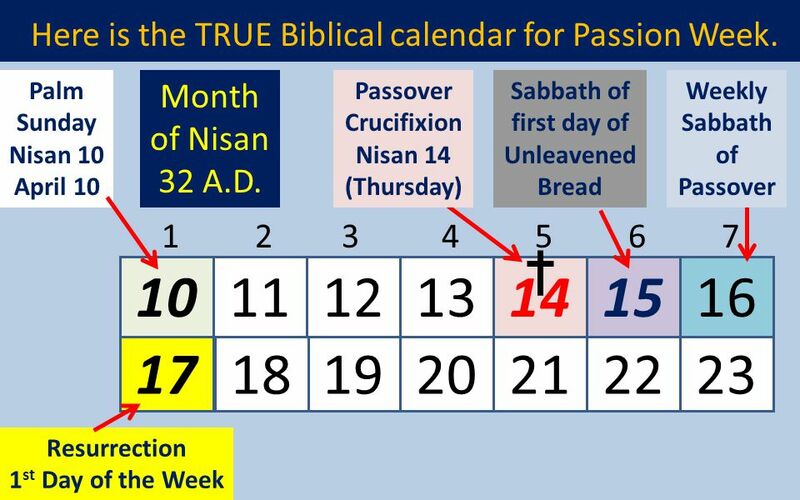 67 The true Biblical calendar for Passion Week. 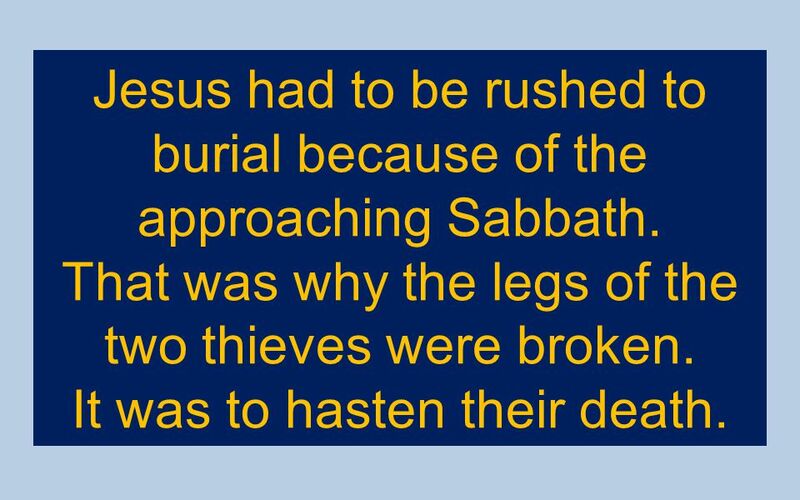 68 Jesus had to be rushed to burial because of the approaching Sabbath. That was why the legs of the two thieves were broken. It was to hasten their death. 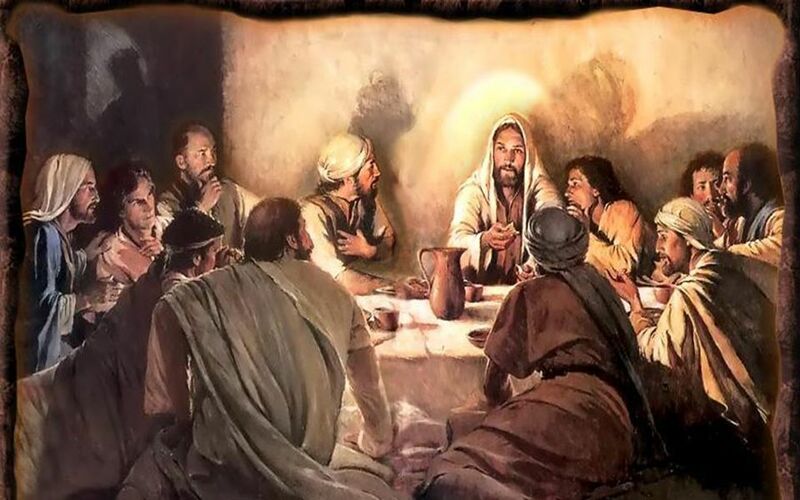 70 The Sabbath that came at sunset after the crucifixion was not the weekly seventh day Sabbath. 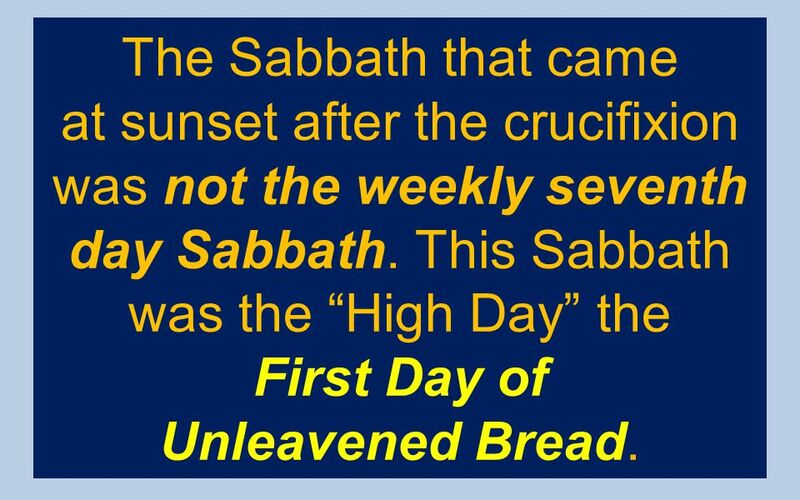 This Sabbath was the “High Day” the First Day of Unleavened Bread. 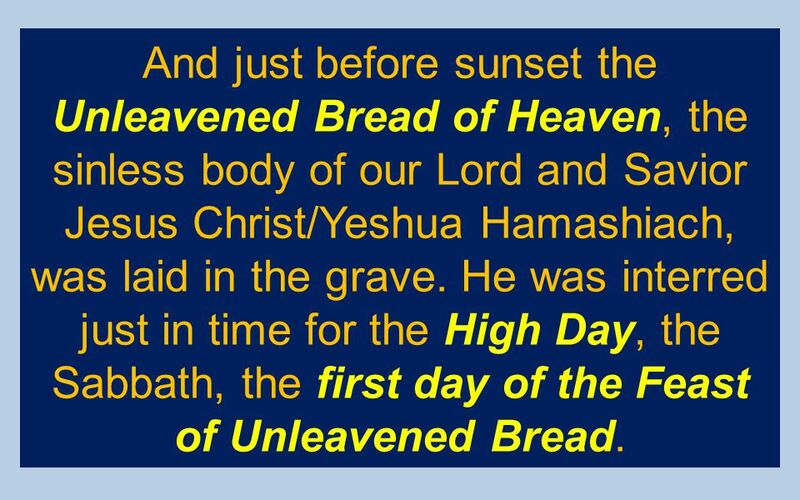 72 And just before sunset the Unleavened Bread of Heaven, the sinless body of our Lord and Savior Jesus Christ/Yeshua Hamashiach, was laid in the grave. 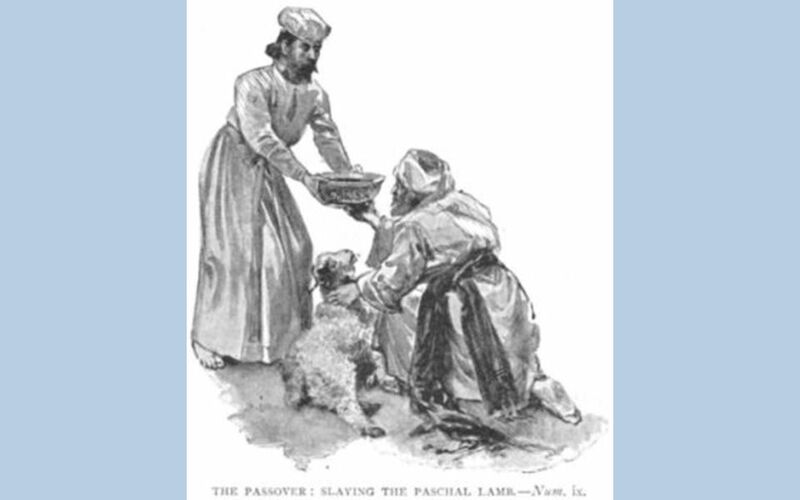 He was interred just in time for the High Day, the Sabbath, the first day of the Feast of Unleavened Bread. 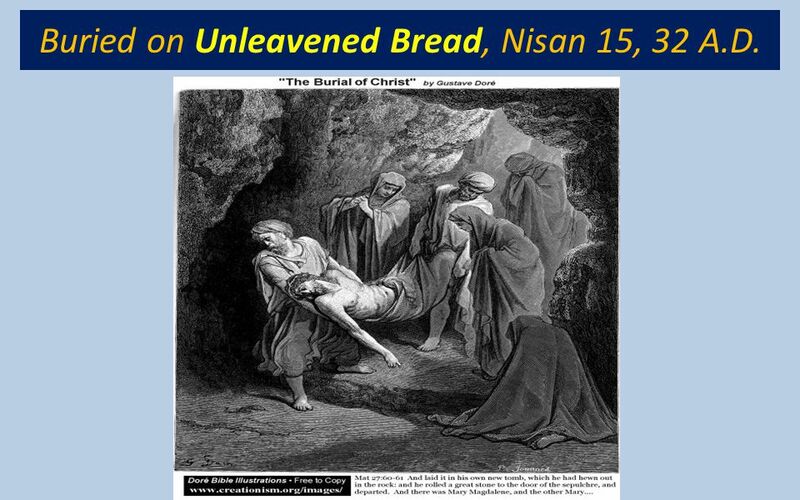 73 Buried on Unleavened Bread, Nisan 15, 32 A.D.
74 As stipulated by Moses in Leviticus 23 the Feast of Unleavened Bread came on the 15th of Nisan. As set forth by God in Genesis days are reckoned from the evening and morning. 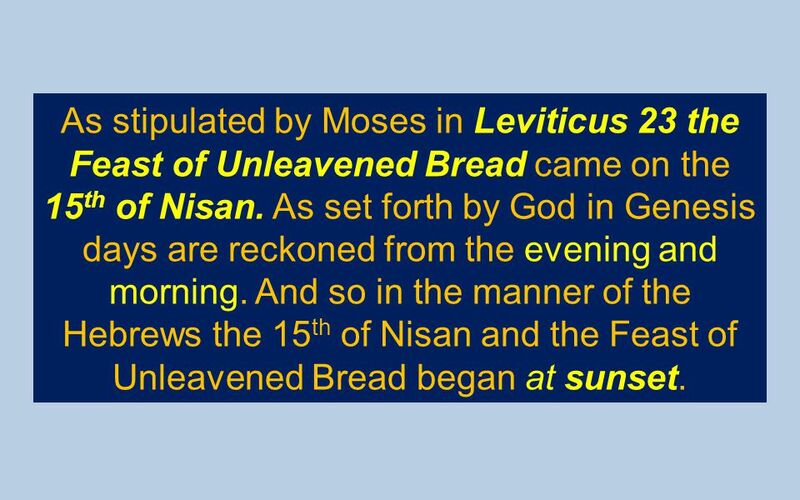 And so in the manner of the Hebrews the 15th of Nisan and the Feast of Unleavened Bread began at sunset. 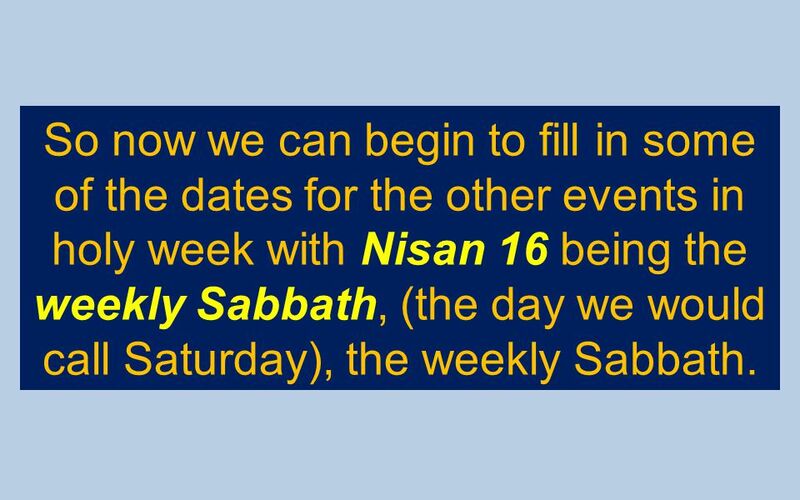 76 So now we can begin to fill in some of the dates for the other events in holy week with Nisan 16 being the weekly Sabbath, (the day we would call Saturday), the weekly Sabbath. 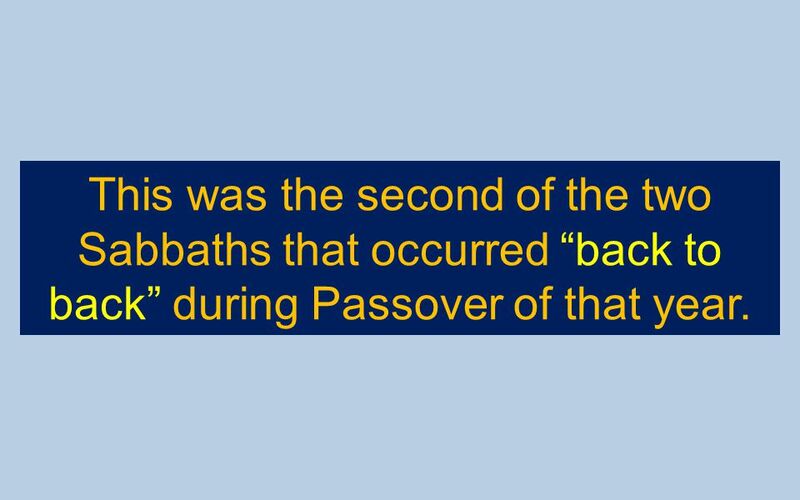 78 This was the second of the two Sabbaths that occurred “back to back” during Passover of that year. 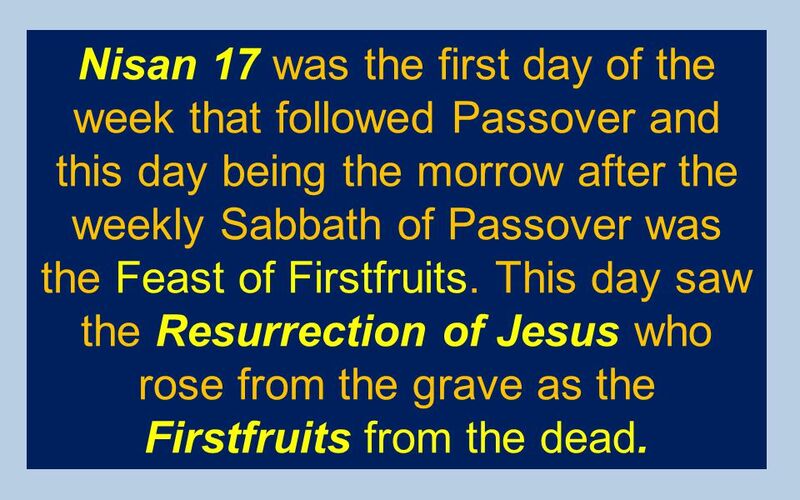 80 Nisan 17 was the first day of the week that followed Passover and this day being the morrow after the weekly Sabbath of Passover was the Feast of Firstfruits. 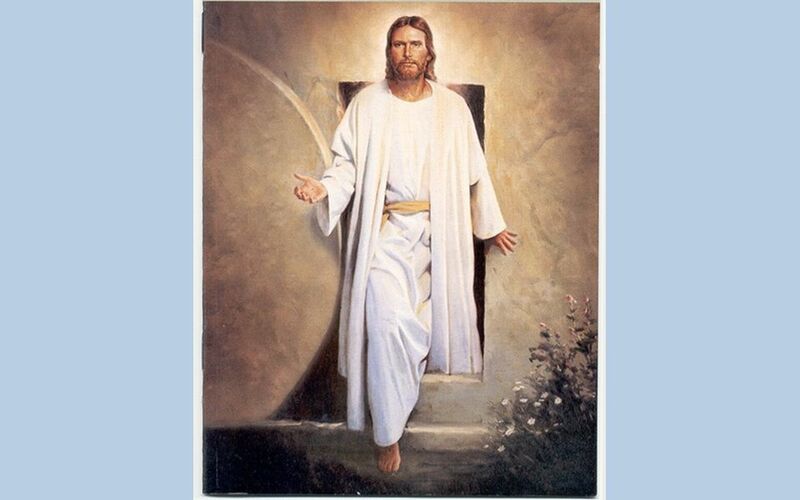 This day saw the Resurrection of Jesus who rose from the grave as the Firstfruits from the dead. 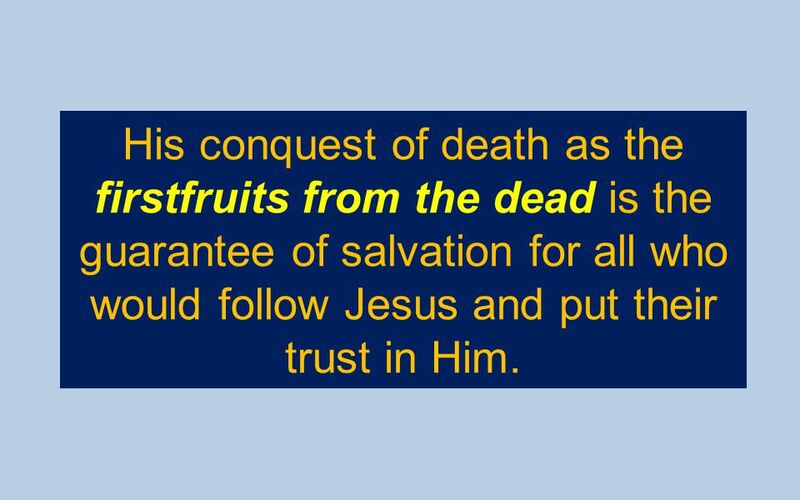 82 His conquest of death as the firstfruits from the dead is the guarantee of salvation for all who would follow Jesus and put their trust in Him. 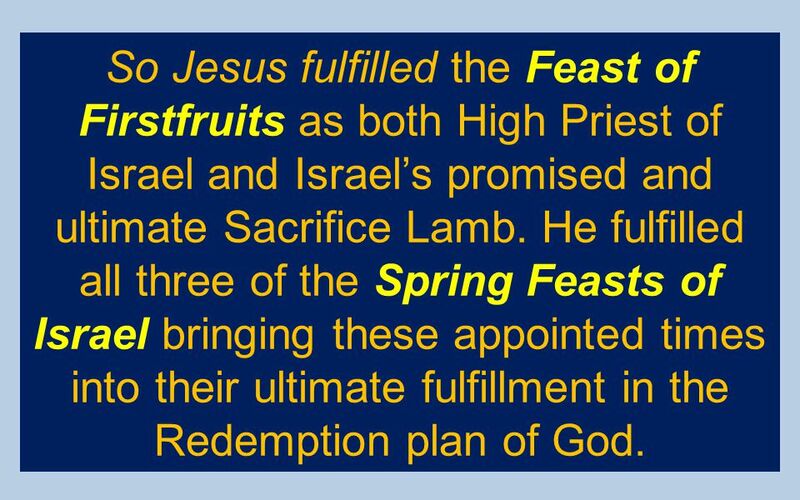 84 So Jesus fulfilled the Feast of Firstfruits as both High Priest of Israel and Israel’s promised and ultimate Sacrifice Lamb. 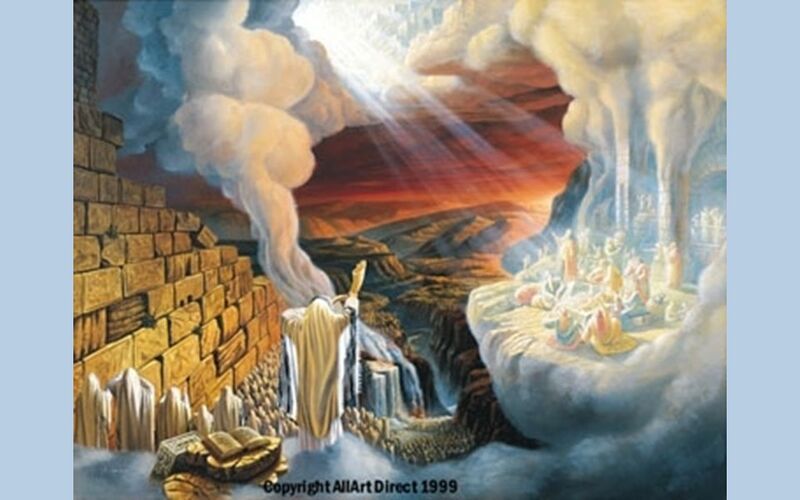 He fulfilled all three of the Spring Feasts of Israel bringing these appointed times into their ultimate fulfillment in the Redemption plan of God. 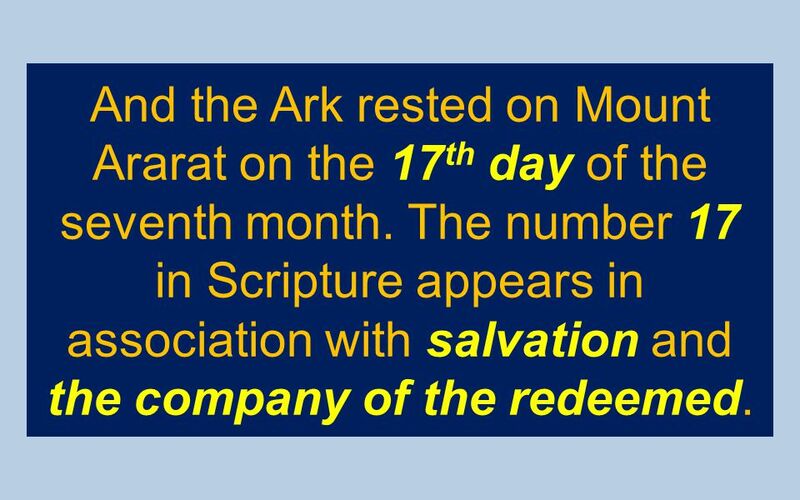 We have seen the 17th day of the month in Scripture before. 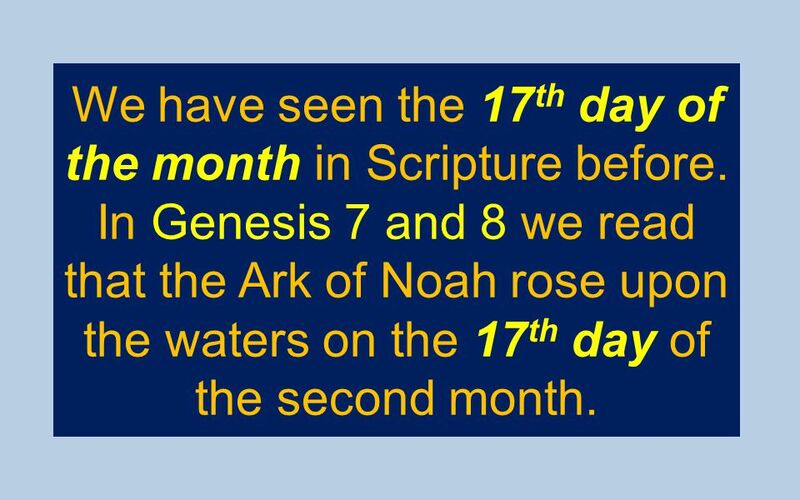 In Genesis 7 and 8 we read that the Ark of Noah rose upon the waters on the 17th day of the second month. 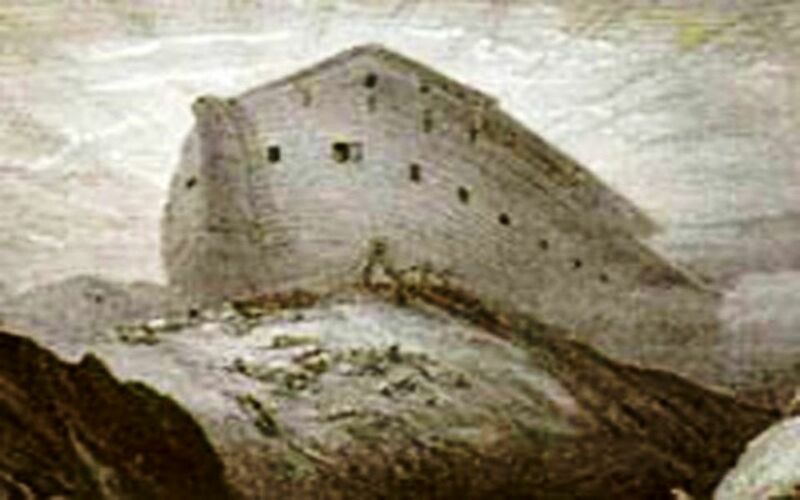 88 And the Ark rested on Mount Ararat on the 17th day of the seventh month. The number 17 in Scripture appears in association with salvation and the company of the redeemed. 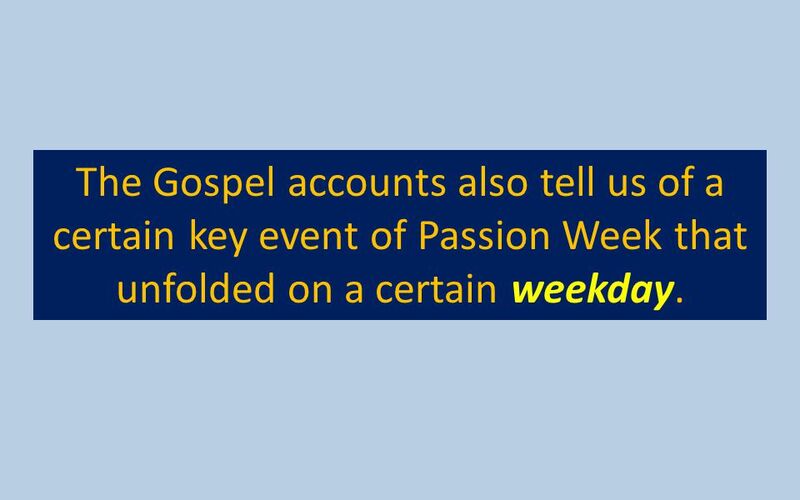 So here is Passion Week as we have been able to determine so far. 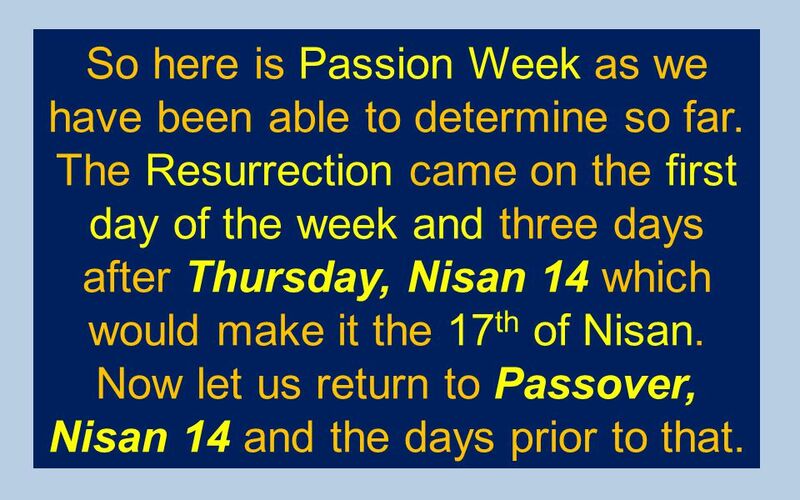 The Resurrection came on the first day of the week and three days after Thursday, Nisan 14 which would make it the 17th of Nisan. 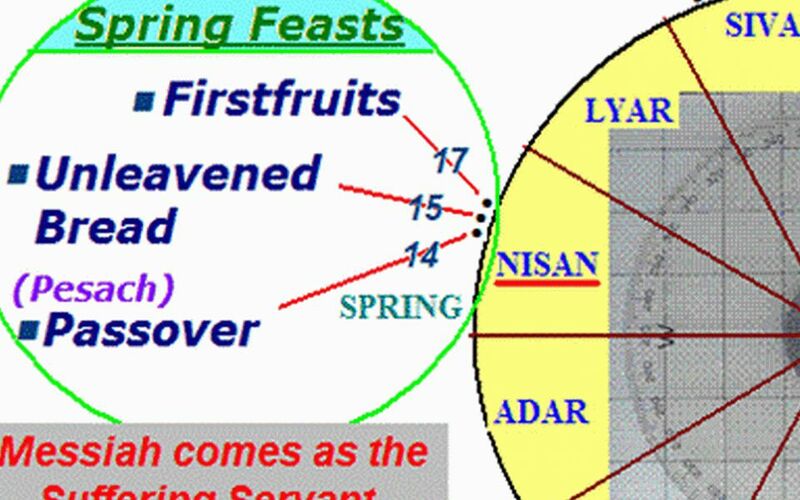 Now let us return to Passover, Nisan 14 and the days prior to that. 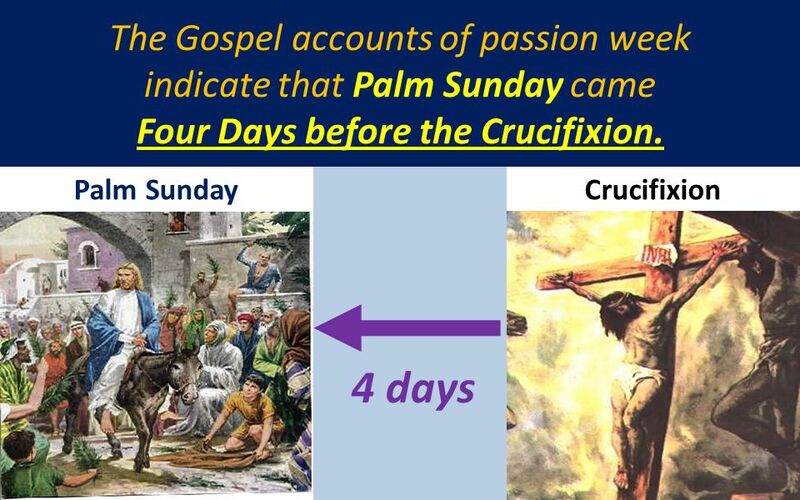 The Gospel accounts of passion week indicate that Palm Sunday came Four Days before the Crucifixion. 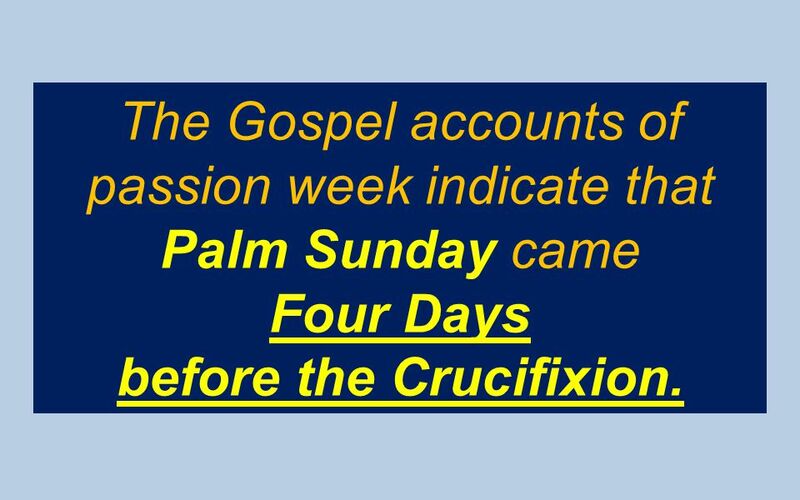 93 The Gospel accounts of passion week indicate that Palm Sunday came Four Days before the Crucifixion. 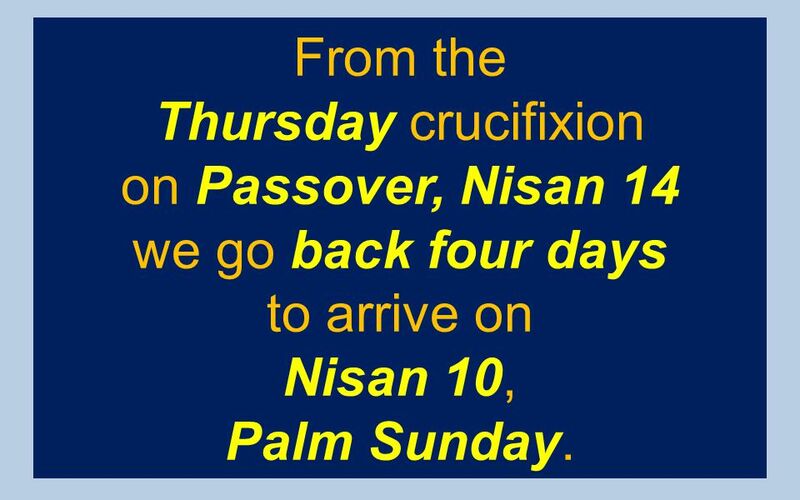 94 From the Thursday crucifixion on Passover, Nisan 14 we go back four days to arrive on Nisan 10, Palm Sunday. 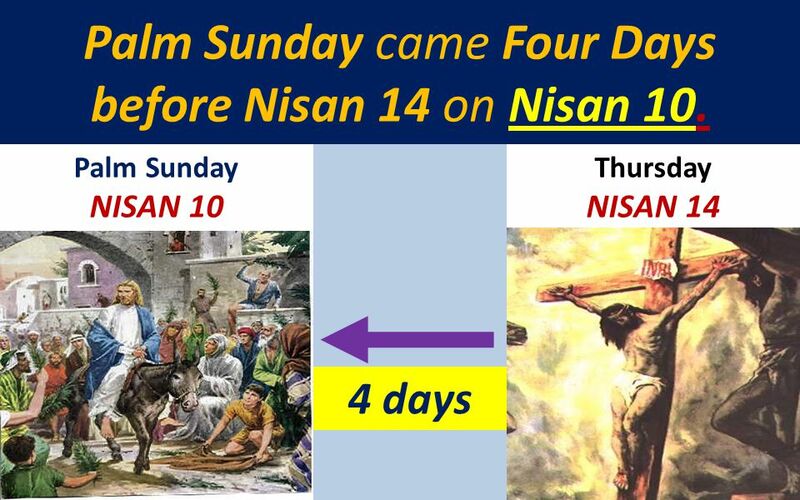 95 Palm Sunday came Four Days before Nisan 14 on Nisan 10. 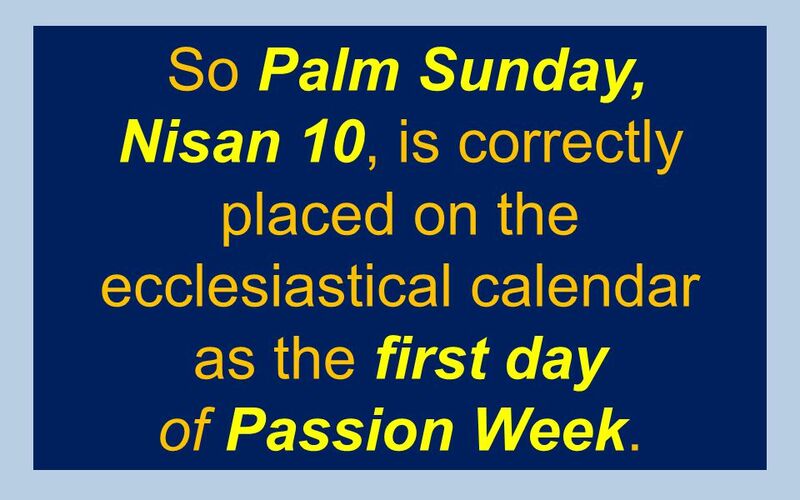 So Palm Sunday, Nisan 10, is correctly placed on the ecclesiastical calendar as the first day of Passion Week. 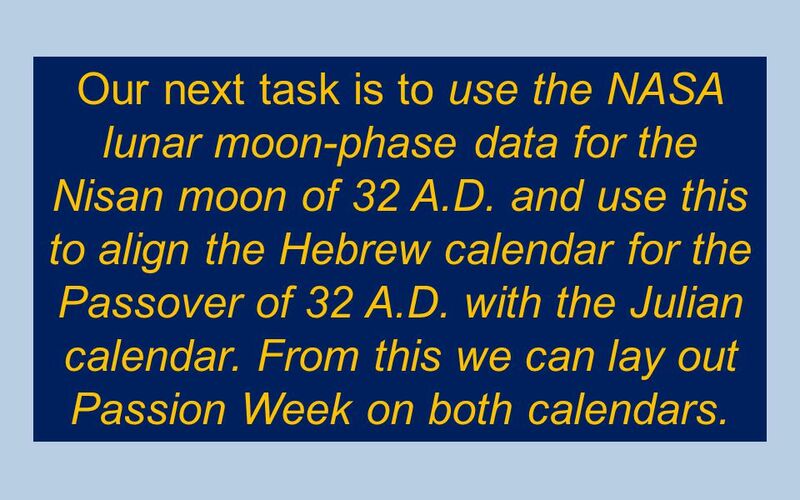 98 Our next task is to use the NASA lunar moon-phase data for the Nisan moon of 32 A.D. and use this to align the Hebrew calendar for the Passover of 32 A.D. with the Julian calendar. 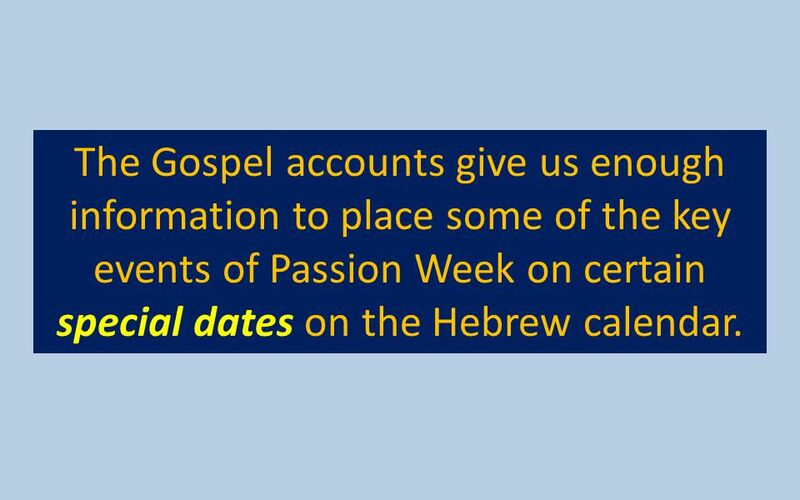 From this we can lay out Passion Week on both calendars. 100 Having determined what the true Julian calendar was for passion week we now compare it to the Julian calendar run back into the first century as the perpetual calendar. 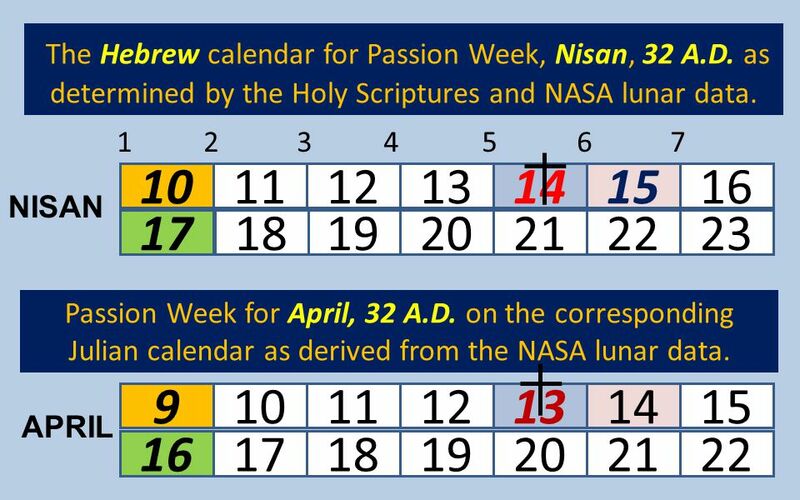 Passion Week for April, 32 A.D. on the Julian calendar as derived from Biblical resources and the NASA lunar data. 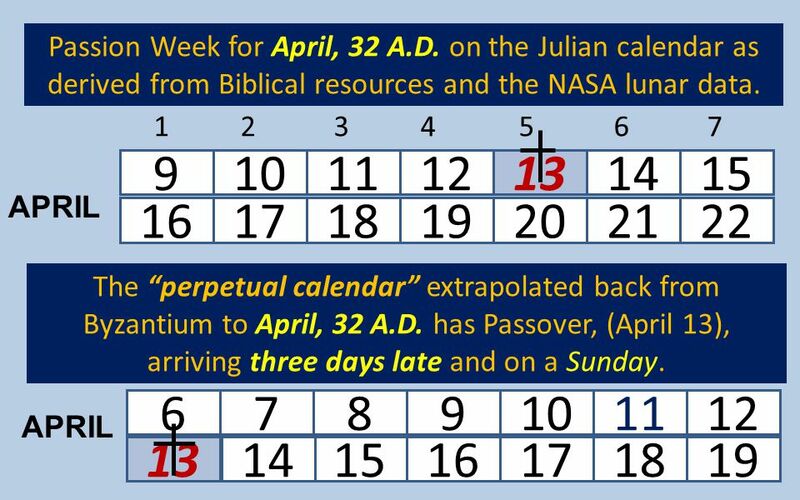 1 2 3 4 5 6 7 9 10 11 12 13 14 15 APRIL 16 17 18 19 20 21 22 The “perpetual calendar” can be extrapolated back from Byzantium to April, 32 A.D. and the week of Passover. ? ? ? ? ? ? ? APRIL ? ? ? ? ? ? ? 102 The perpetual calendar for any year can easily be found online by Googling “perpetual calendar”. 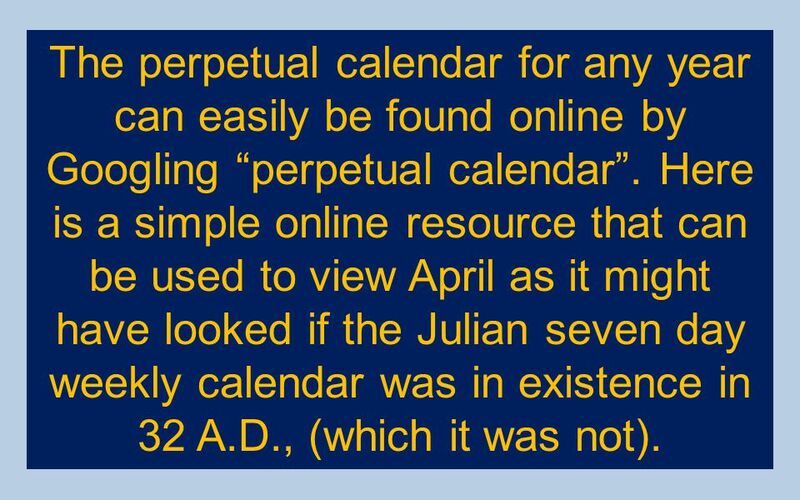 Here is a simple online resource that can be used to view April as it might have looked if the Julian seven day weekly calendar was in existence in 32 A.D., (which it was not). 104 So we are imagining a nonexistent calendar, a calendar extrapolated back from our present calendar which we assume has been carried on faithfully from the former Jewish calendar we saw in the 1st century. And what do we see? 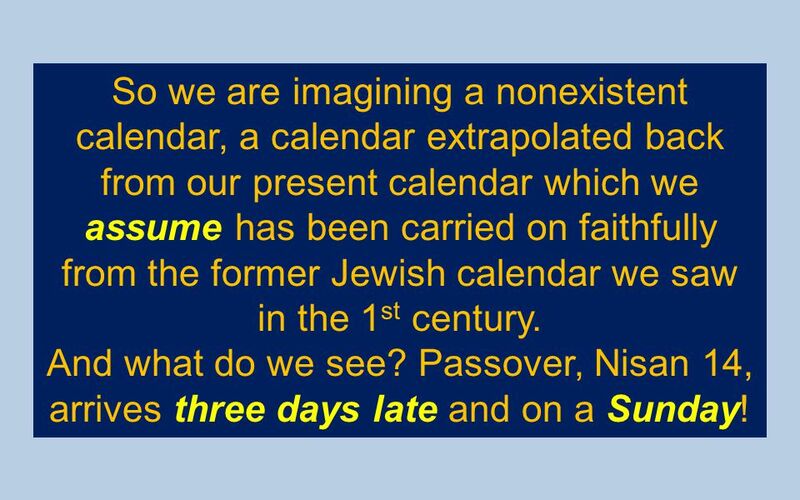 Passover, Nisan 14, arrives three days late and on a Sunday! Quite clearly there is a disconnect, a slippage. Just what is that slippage? 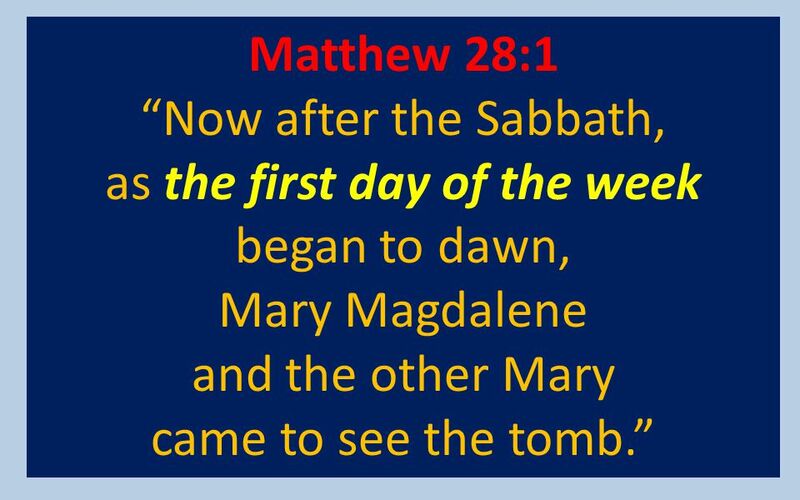 If we can determine what happened then perhaps we can identify the weekday on our present Western calendar which is the true and original Sabbath. 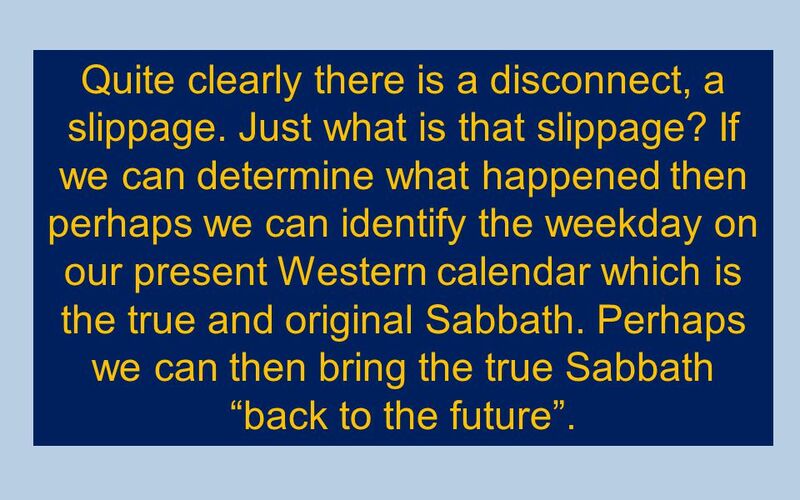 Perhaps we can then bring the true Sabbath “back to the future”. 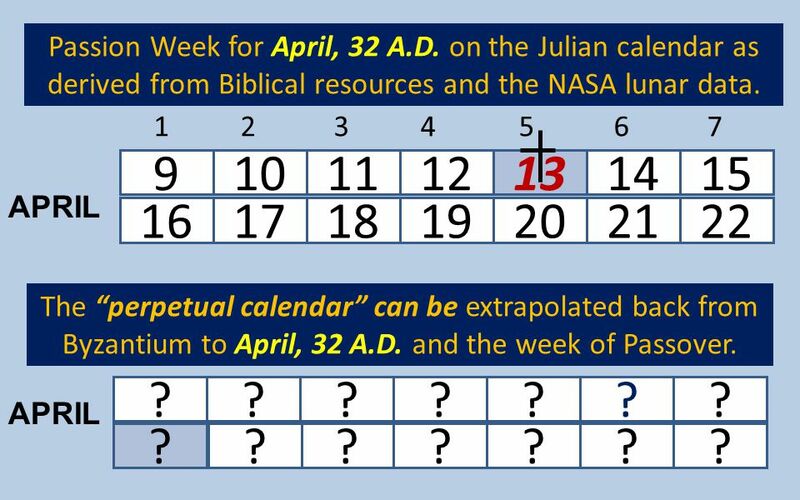 So after establishing the year 32 A.D. as the Passion Year and placing the events on of Holy Week on the Julian calendar we can roll back the Julian perpetual calendar and see if it meshes. 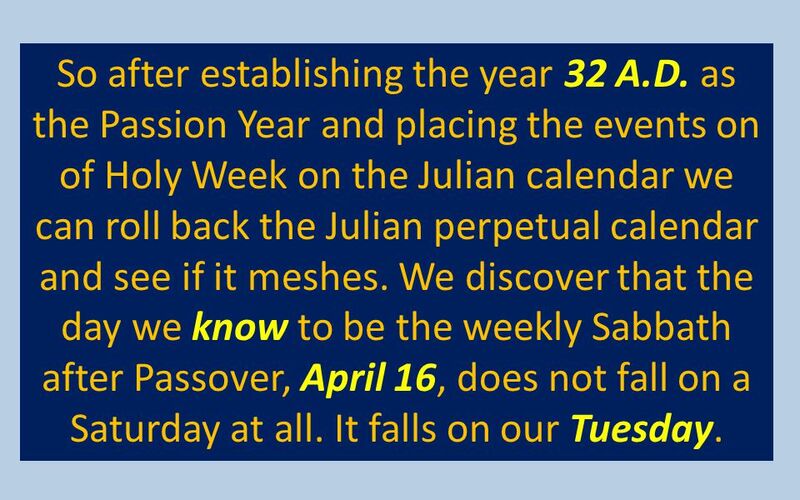 We discover that the day we know to be the weekly Sabbath after Passover, April 16, does not fall on a Saturday at all. It falls on our Tuesday. 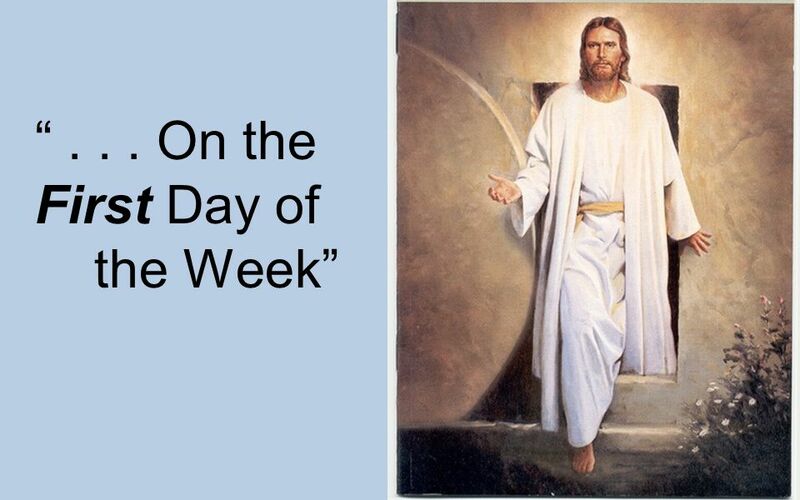 109 Passion Week for April, 32 A.D. There is a serious and significant mismatch. 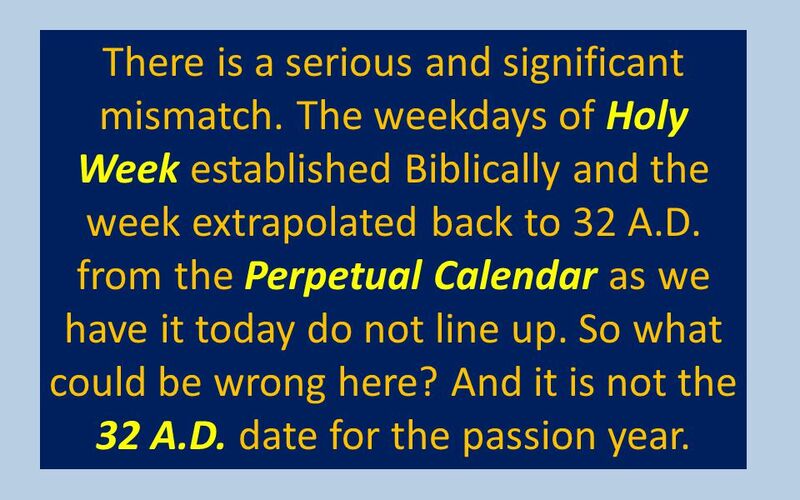 The weekdays of Holy Week established Biblically and the week extrapolated back to 32 A.D. from the Perpetual Calendar as we have it today do not line up. So what could be wrong here? And it is not the 32 A.D. date for the passion year. 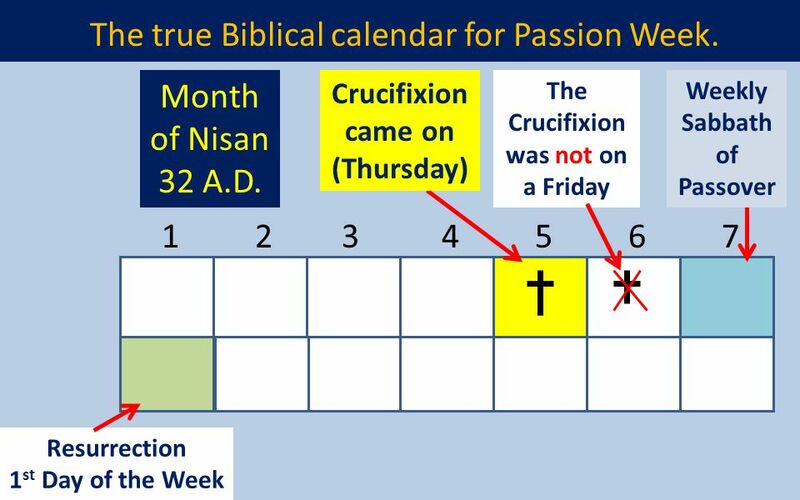 111 Passion Week for April, 32 A.D.
112 The 32 A.D. date for the crucifixion year is proven correct by a faithful interpretation and calculation of the chronology of the first 69 Weeks of the Seventy Weeks Prophecy. 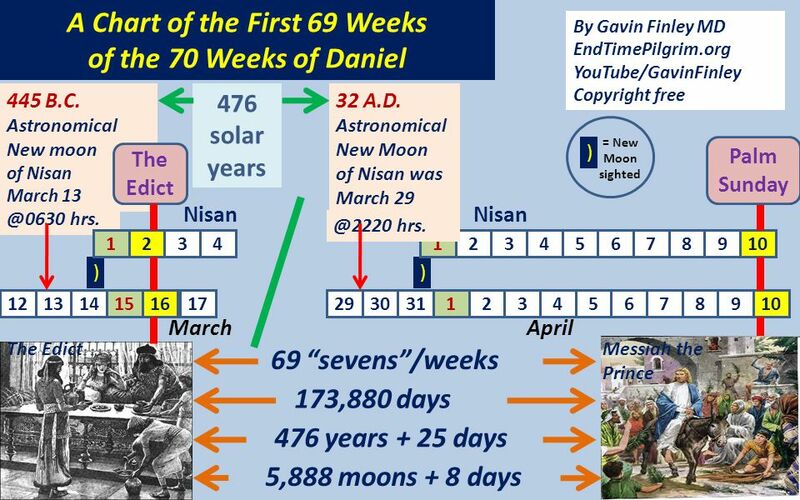 114 So it appears that our present day Roman solar calendar has a seven day weekly cadence that tracks three days later than the first century Hebrew calendar. So what are we left to conclude here? 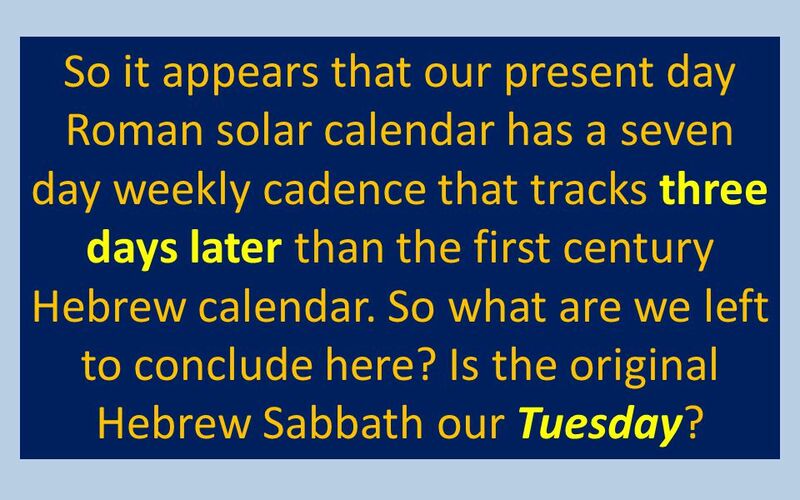 Is the original Hebrew Sabbath our Tuesday? 115 Passion Week for April, 32 A.D.
Our present day Perpetual Calendar does not match up with Passion Week. 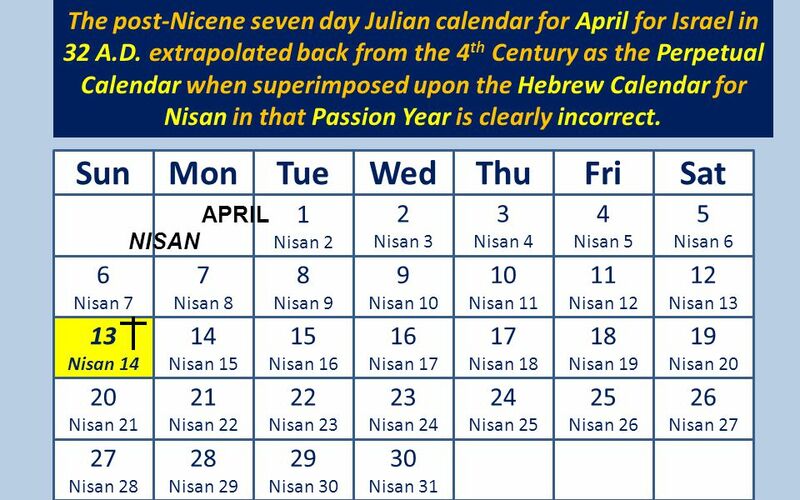 And we know that the Julian calendar was changed from an eight day week to a seven day week back at the Council of Niceae in 325 A.D.. 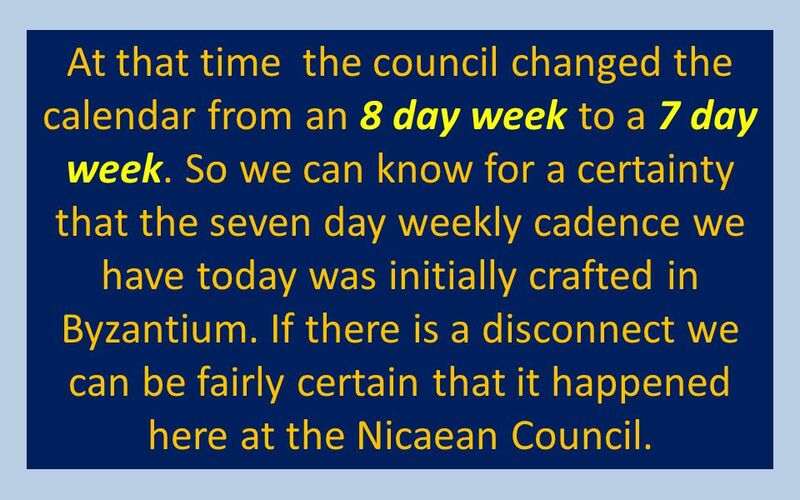 So the weekly cadence we see in the new seven day calendar set forth at Niceae has now become the prime suspect in this mismatch. Here is a brief historical background to all this. At no time before the fourth century did the Romans have a seven day week. 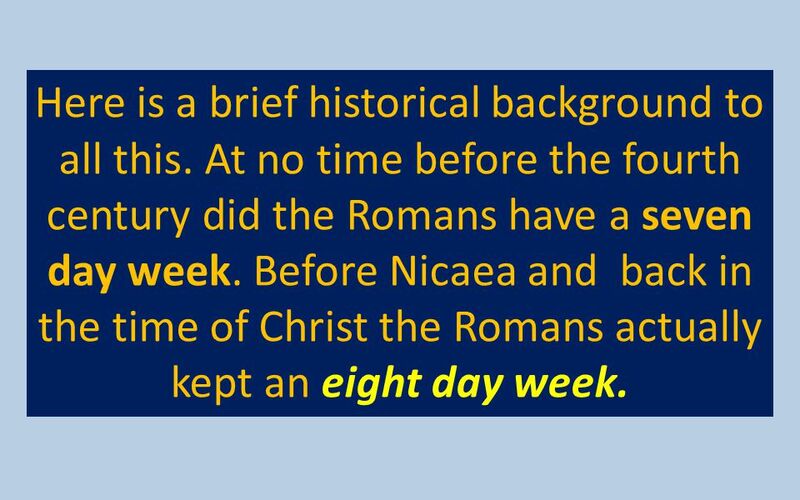 Before Nicaea and back in the time of Christ the Romans actually kept an eight day week. 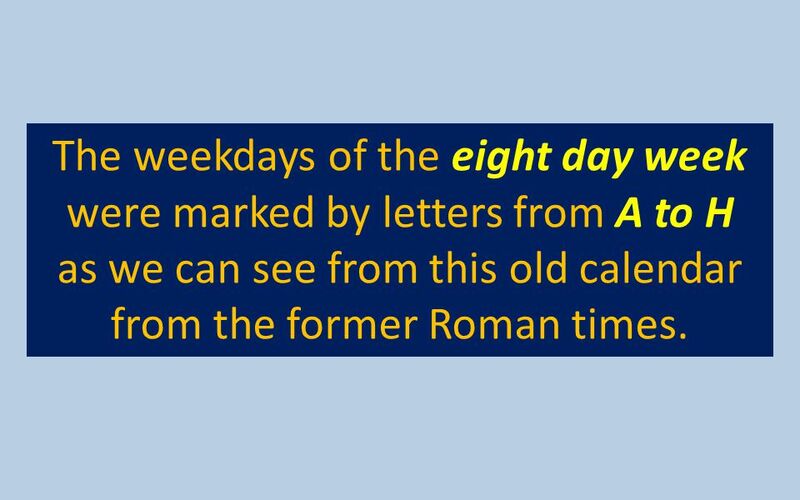 as we can see from this old calendar from the former Roman times. 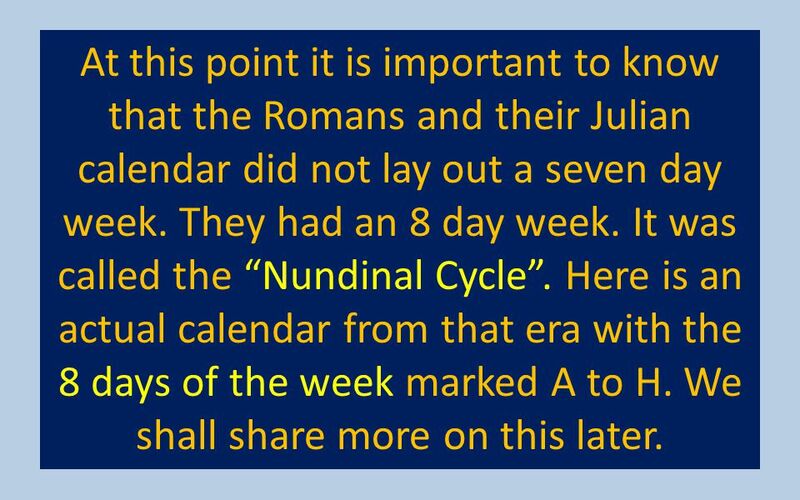 122 This was the “Nundinal Cycle” named for the ninth day which was the first day of the following week. 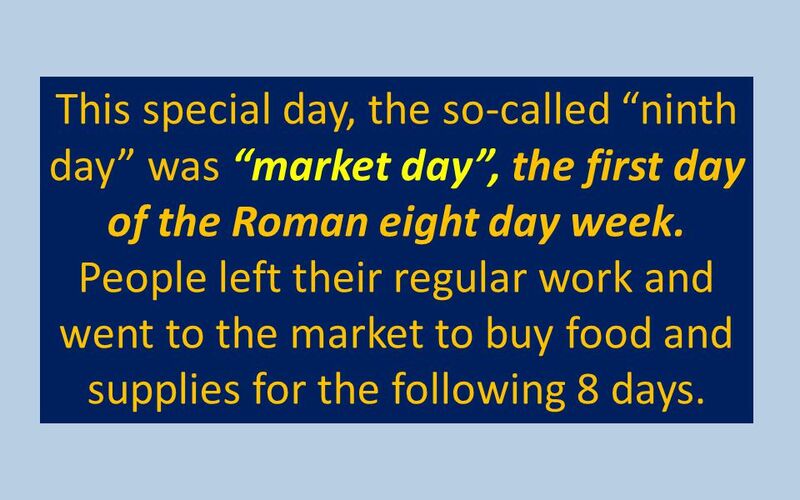 of the Roman eight day week. 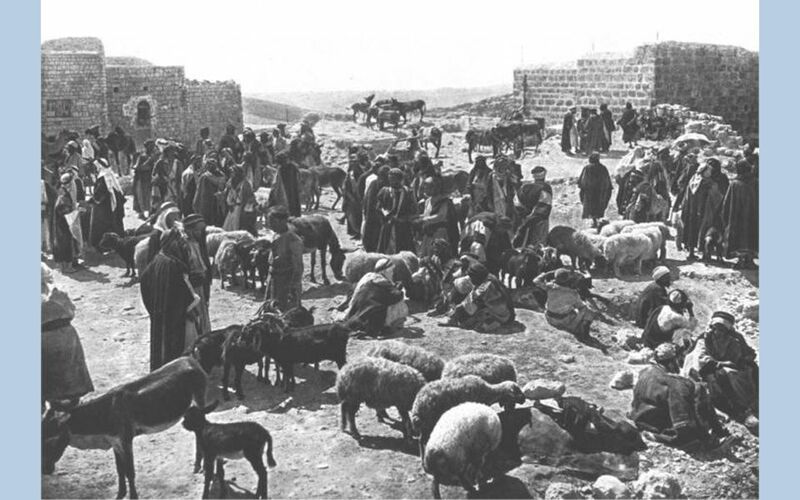 People left their regular work and went to the market to buy food and supplies for the following 8 days. 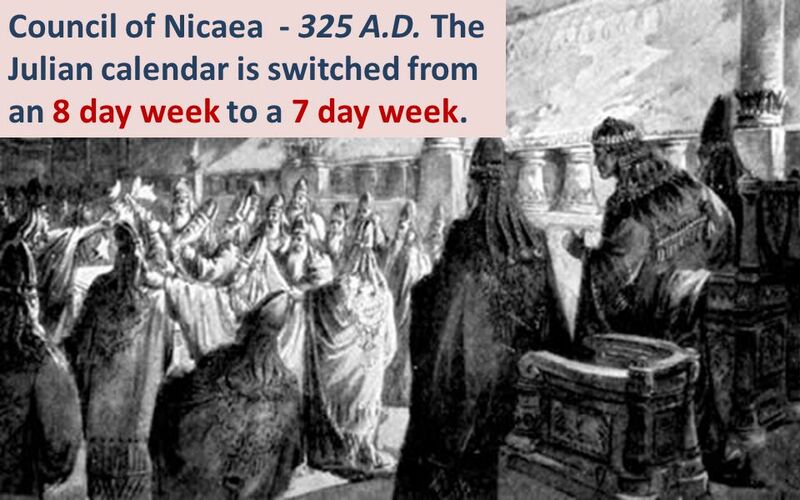 126 This early Roman 8 day week was changed to a seven day week during the first Council at Nicaea in 325 A.D.. But now we have evidence that something else happened as well. 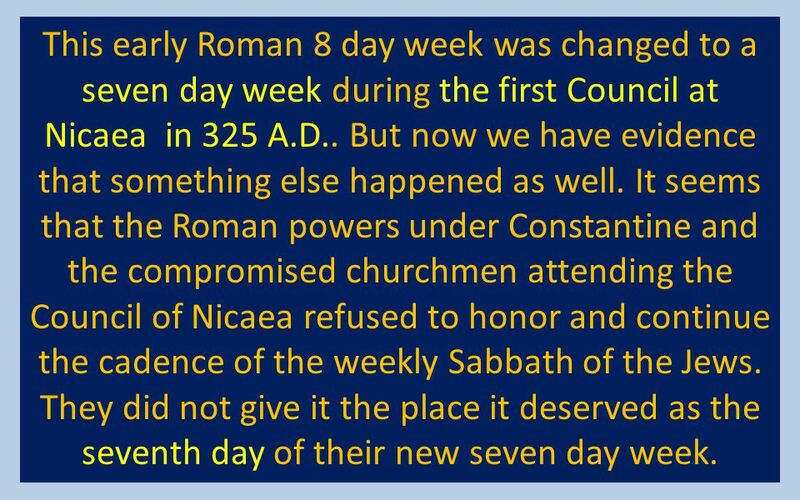 It seems that the Roman powers under Constantine and the compromised churchmen attending the Council of Nicaea refused to honor and continue the cadence of the weekly Sabbath of the Jews. They did not give it the place it deserved as the seventh day of their new seven day week. 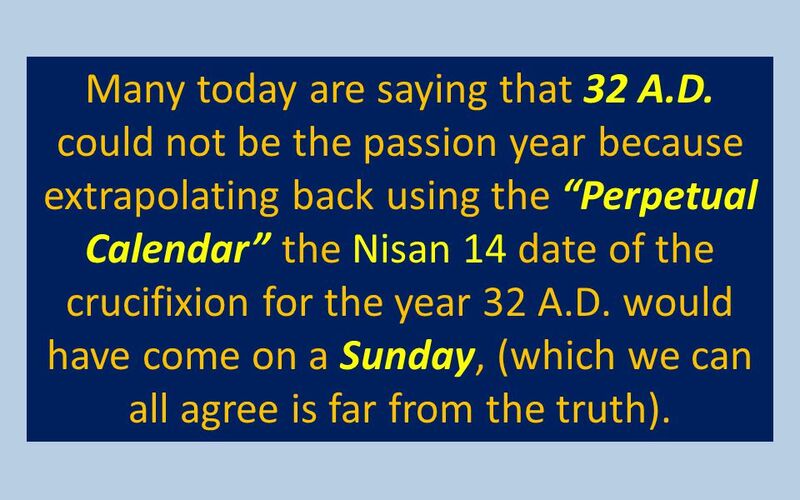 Many today are saying that 32 A.D. could not be the passion year because extrapolating back using the “Perpetual Calendar” the Nisan 14 date of the crucifixion for the year 32 A.D. would have come on a Sunday, (which we can all agree is far from the truth). 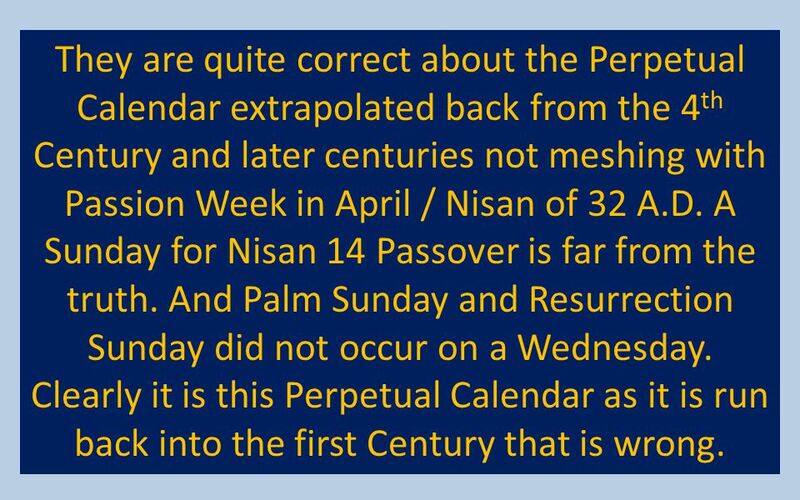 130 They are quite correct about the Perpetual Calendar extrapolated back from the 4th Century and later centuries not meshing with Passion Week in April / Nisan of 32 A.D. A Sunday for Nisan 14 Passover is far from the truth. 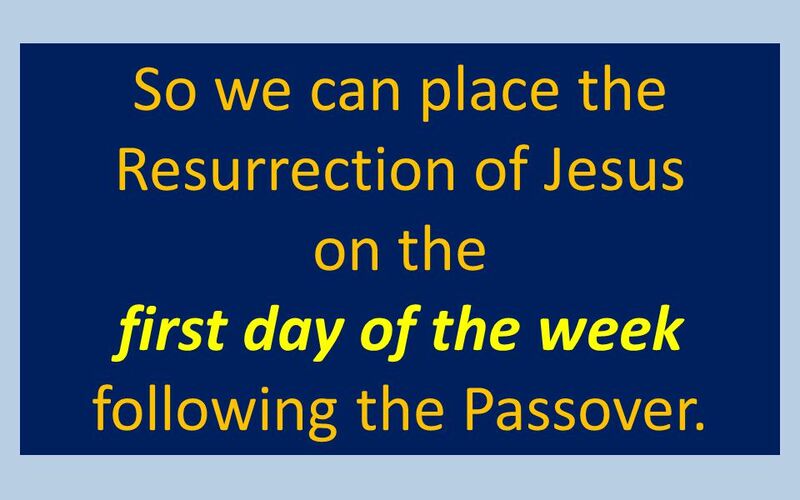 And Palm Sunday and Resurrection Sunday did not occur on a Wednesday. Clearly it is this Perpetual Calendar as it is run back into the first Century that is wrong. 131 3 days later on a Wednesday ? The Perpetual Calendar extrapolated back from beyond Nicaea is out of synch with the weekday events of Passion week we can confirm from Biblical sources and astronomical data . 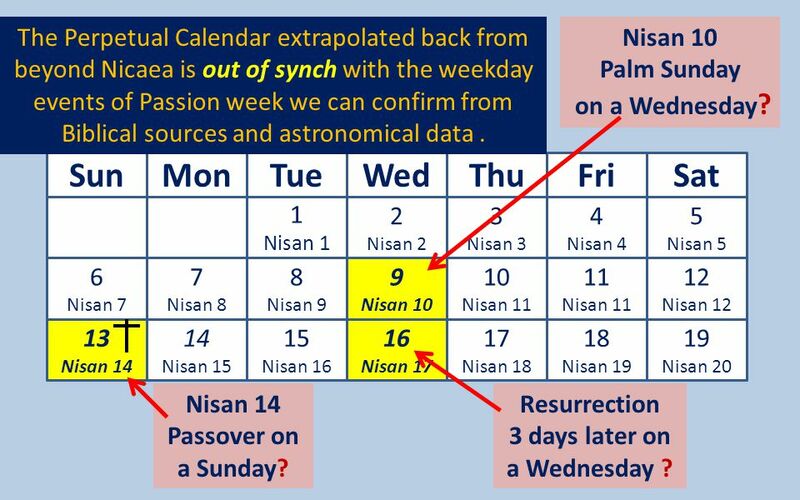 Nisan 10 Palm Sunday on a Wednesday? Sun Mon Tue Wed Thu Fri Sat 1 Nisan 1 2 Nisan 2 3 Nisan 3 4 Nisan 4 5 Nisan 5 6 Nisan 7 7 Nisan 8 8 Nisan 9 9 Nisan 10 10 Nisan 11 11 Nisan 11 12 Nisan 12 13 Nisan 14 14 Nisan 15 15 Nisan 16 16 Nisan 17 17 Nisan 18 18 Nisan 19 19 Nisan 20 Nisan 14 Passover on a Sunday? Resurrection 3 days later on a Wednesday ? 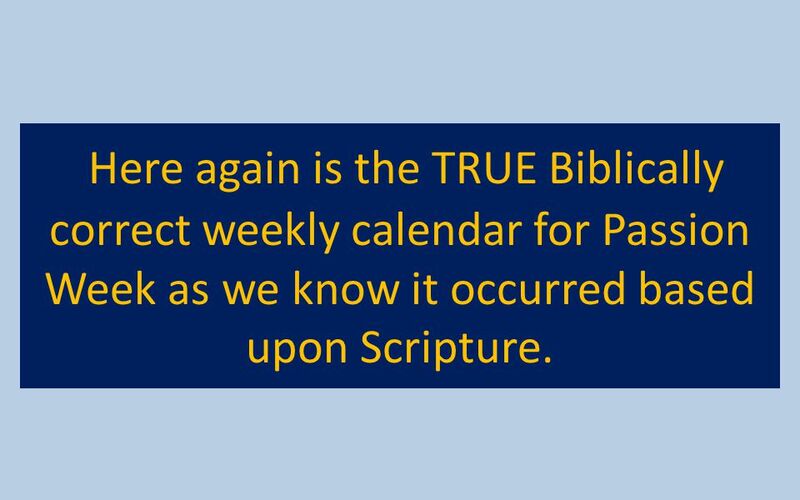 132 Here again is the TRUE Biblically correct weekly calendar for Passion Week as we know it occurred based upon Scripture. 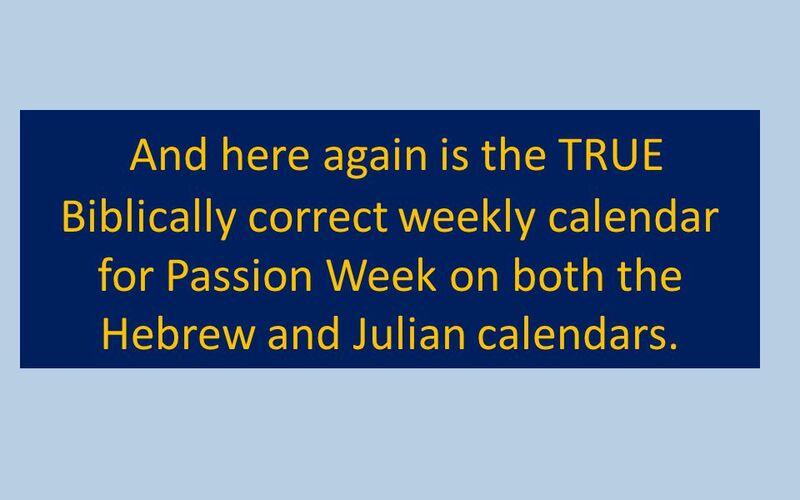 134 And here again is the TRUE Biblically correct weekly calendar for Passion Week on both the Hebrew and Julian calendars. 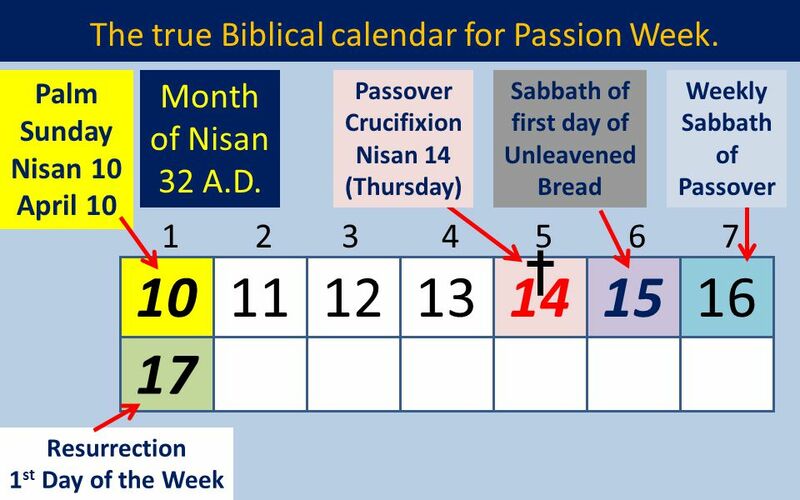 136 As we can see, the TRUE Biblically correct weekly calendar for Passion Week conflicts with the Perpetual Calendar. 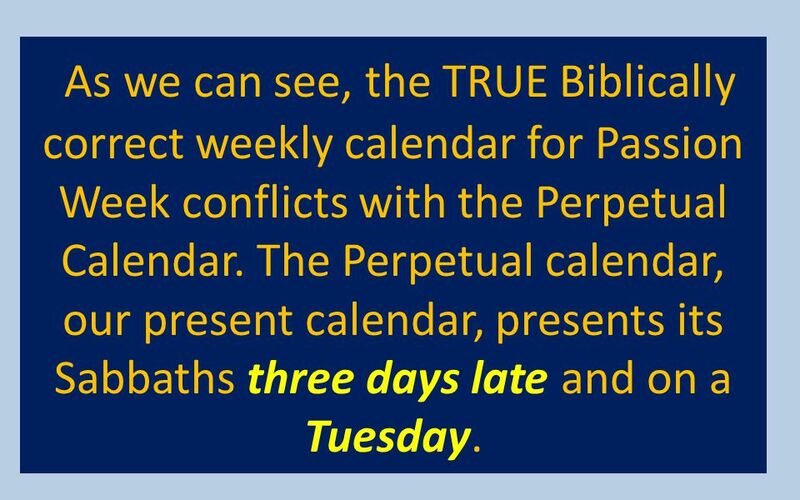 The Perpetual calendar, our present calendar, presents its Sabbaths three days late and on a Tuesday. 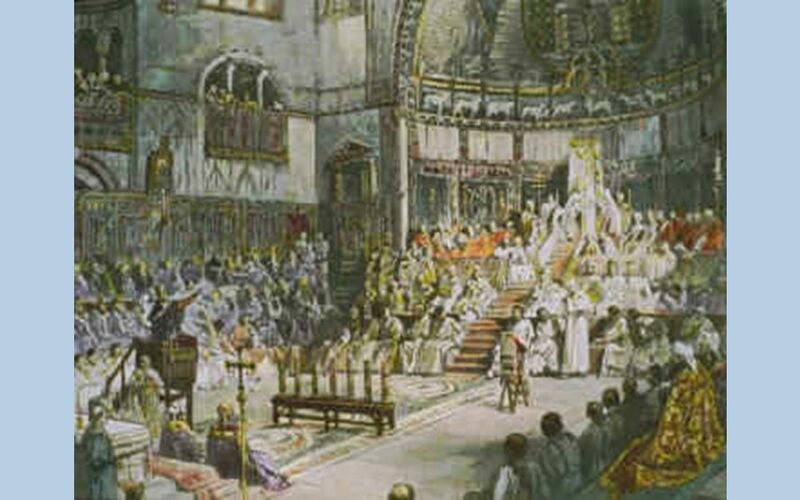 137 Passion Week as it truly unfolded in April, 32 A.D.
138 And so we come to the big question. 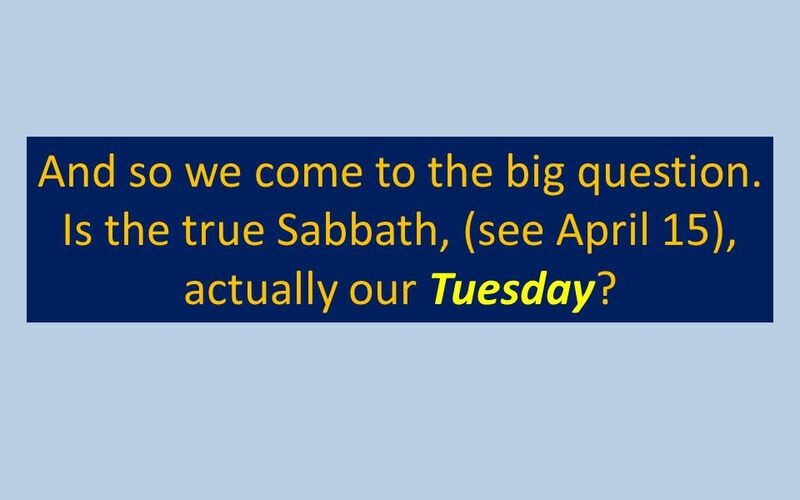 Is the true Sabbath, (see April 15), actually our Tuesday? 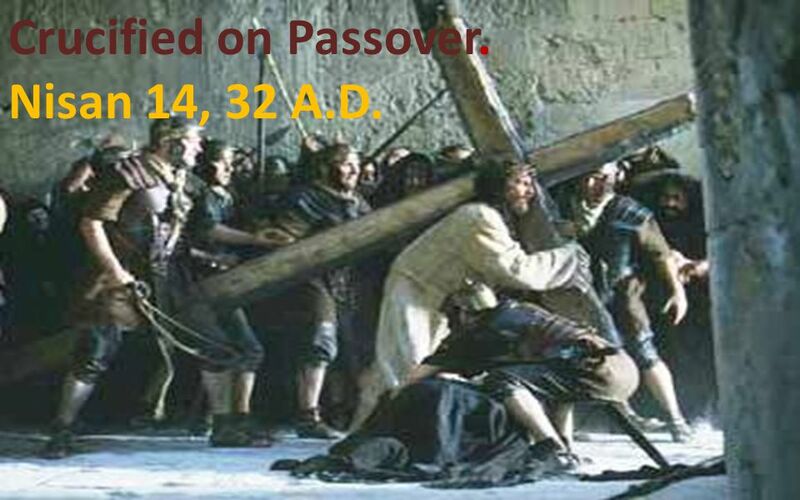 139 Passion Week as it truly unfolded in April, 32 A.D.
Has violence has been committed against Yehoveh-God’s Sabbath? What if we find out that the Original Sabbath has been DIS-MEMBERED? 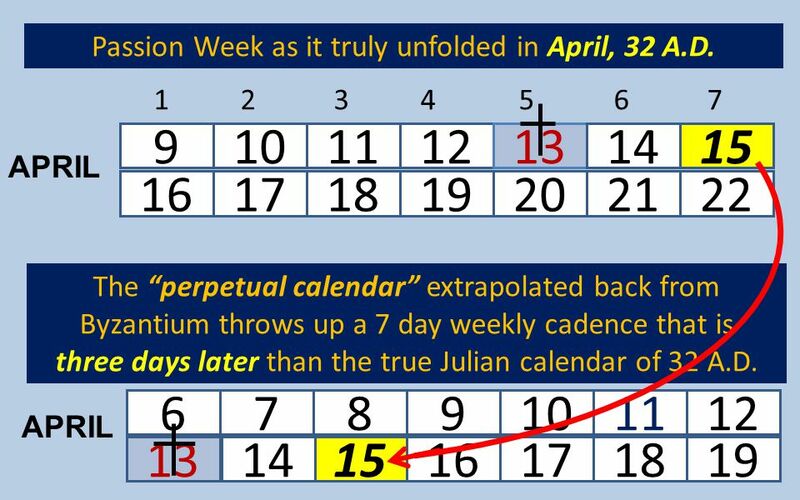 What if it was pushed back three days from its true and ancient seven day weekly cadence? 141 The 7 day week of our Roman/Perpetual calendar after Nicaea. 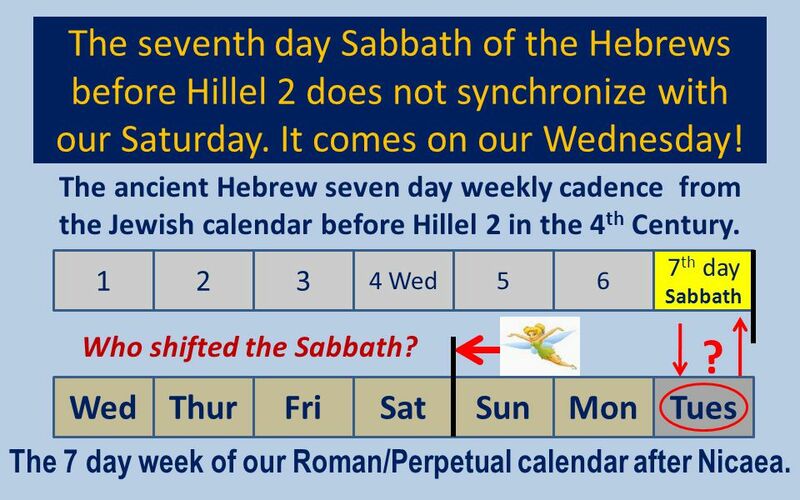 The seventh day Sabbath of the Hebrews before Hillel 2 does not synchronize with our Saturday. It comes on our Wednesday! The ancient Hebrew seven day weekly cadence from the Jewish calendar before Hillel 2 in the 4th Century. 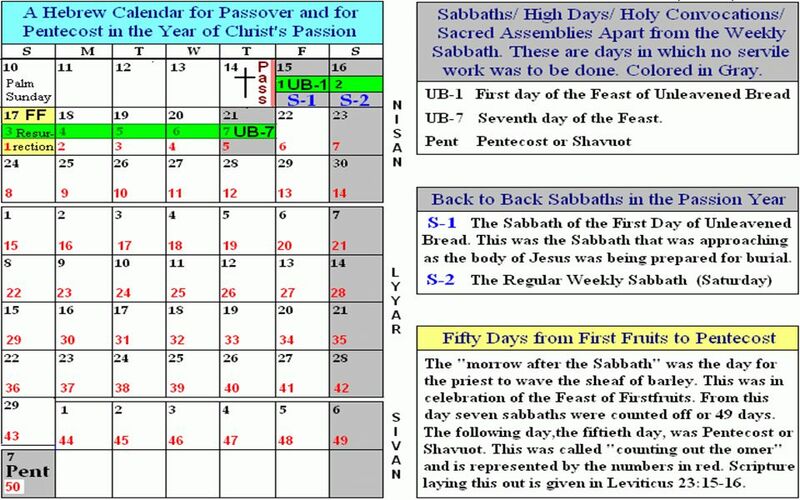 1 2 3 4 Wed 5 6 7th day Sabbath Who shifted the Sabbath? ? 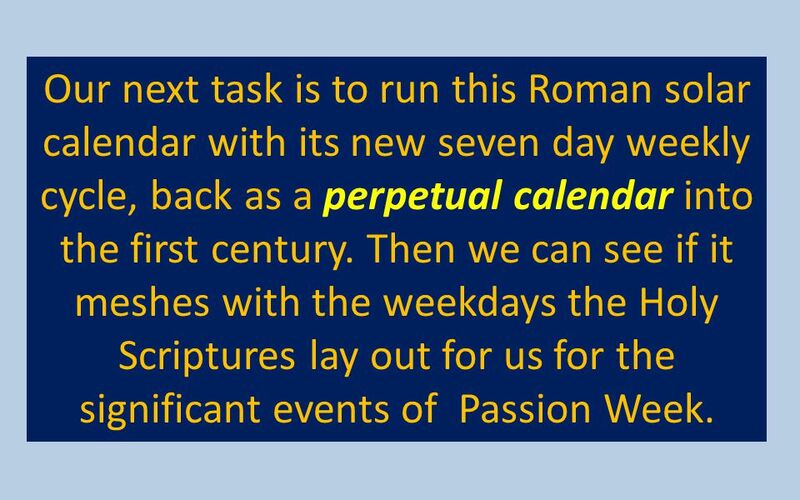 Wed Thur Fri Sat Sun Mon Tues The 7 day week of our Roman/Perpetual calendar after Nicaea. 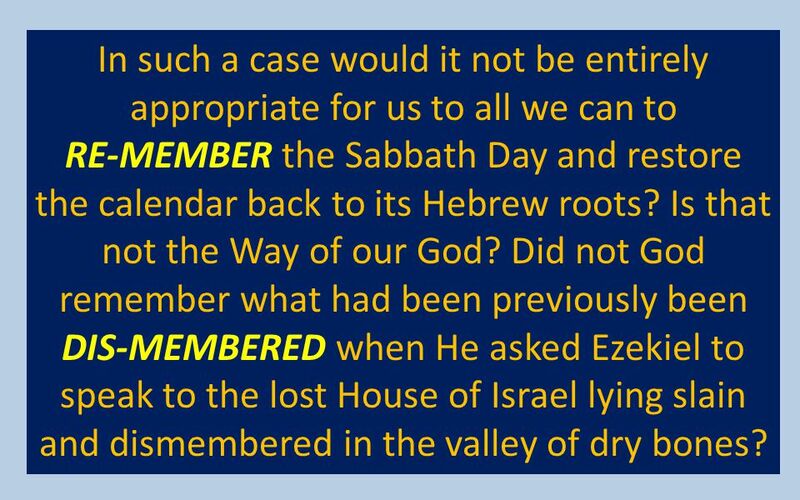 RE-MEMBER the Sabbath Day and restore the calendar back to its Hebrew roots? Is that not the Way of our God? 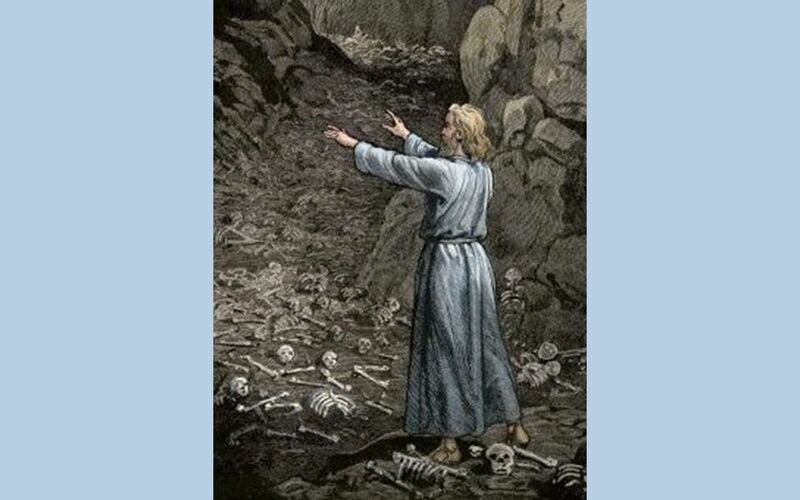 Did not God remember what had been previously been DIS-MEMBERED when He asked Ezekiel to speak to the lost House of Israel lying slain and dismembered in the valley of dry bones? 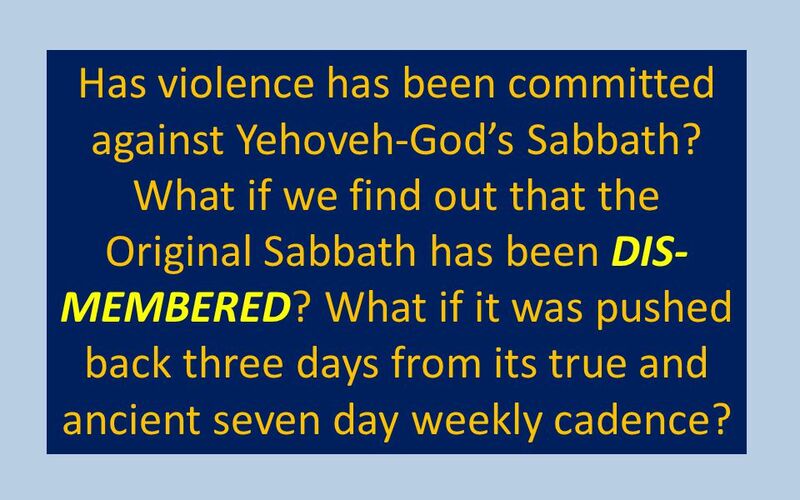 144 So if the Original Sabbath has been DIS-MEMBERED and pushed from its ancient seven day weekly cadence what are we to do about it? 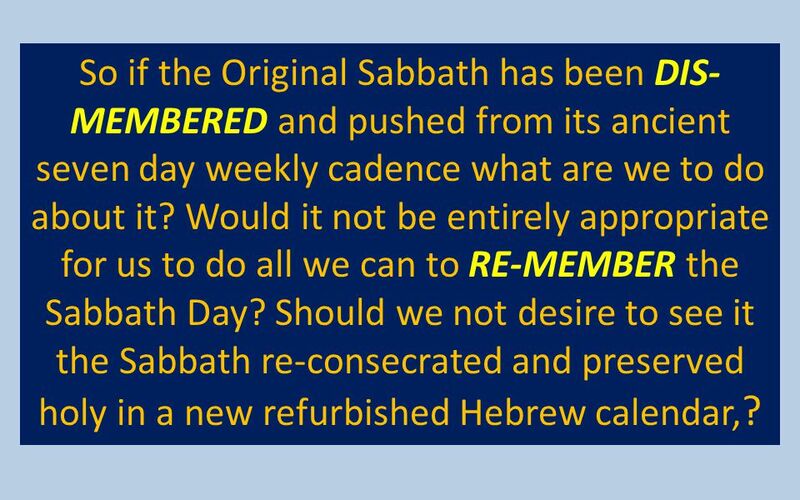 Would it not be entirely appropriate for us to do all we can to RE-MEMBER the Sabbath Day? Should we not desire to see it the Sabbath re-consecrated and preserved holy in a new refurbished Hebrew calendar,? this. 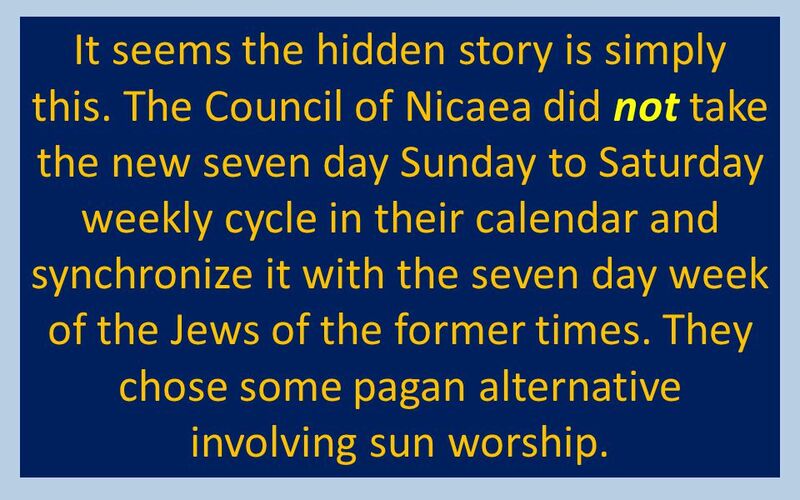 The Council of Nicaea did not take the new seven day Sunday to Saturday weekly cycle in their calendar and synchronize it with the seven day week of the Jews of the former times. They chose some pagan alternative involving sun worship. 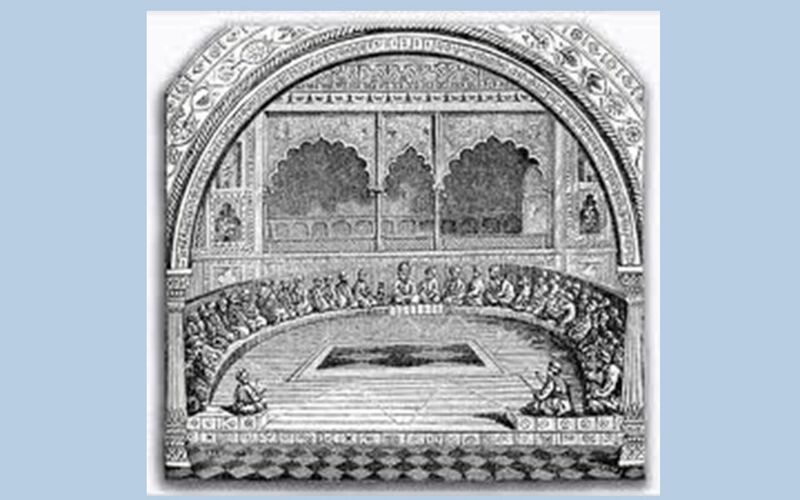 147 The Council of Nicaea Convened by Roman Caesar Constantine 325 A.D.
148 And think of this. 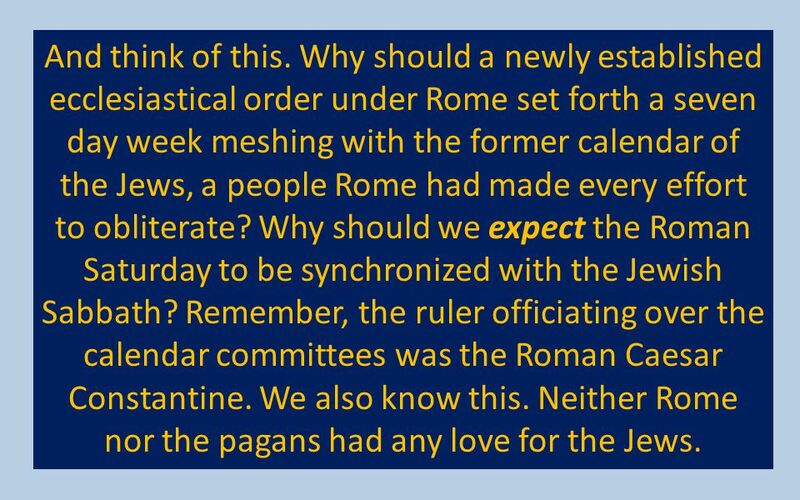 Why should a newly established ecclesiastical order under Rome set forth a seven day week meshing with the former calendar of the Jews, a people Rome had made every effort to obliterate? 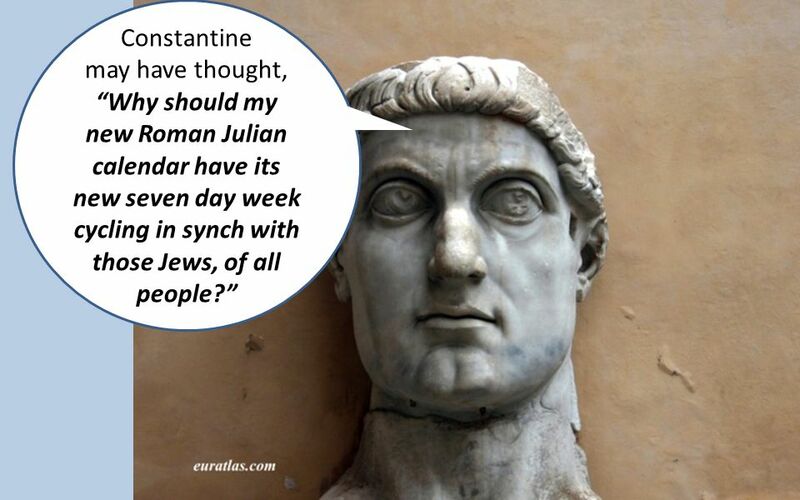 Why should we expect the Roman Saturday to be synchronized with the Jewish Sabbath? 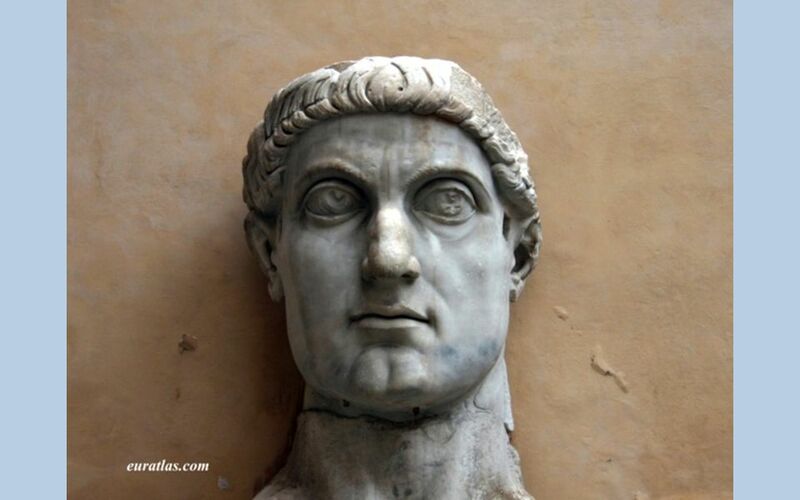 Remember, the ruler officiating over the calendar committees was the Roman Caesar Constantine. We also know this. 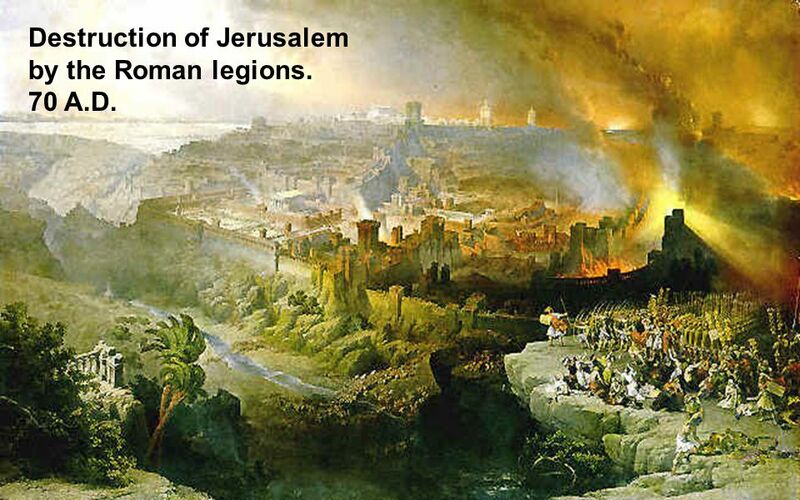 Neither Rome nor the pagans had any love for the Jews. 150 So the Romans and pagans presiding with Christian bishops over these calendar changes established their new seven day week. Now we come to our discover that their Saturday lagged three days behind the Hebrew Sabbath. 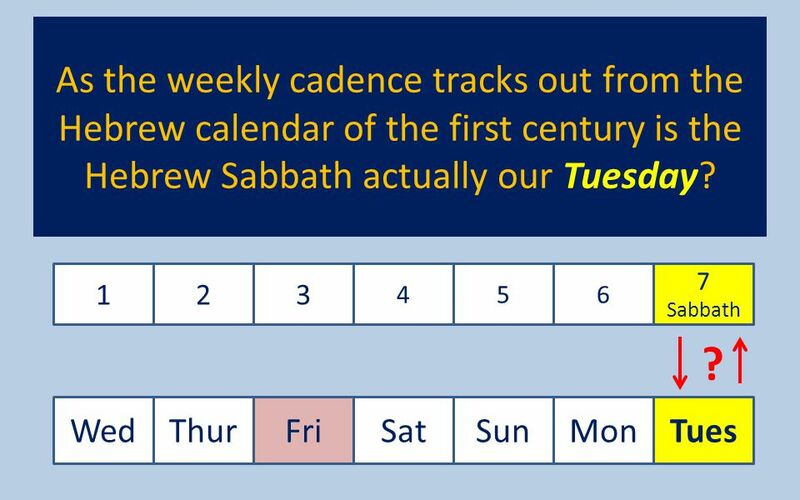 So the true seventh day Sabbath is actually our Tuesday. 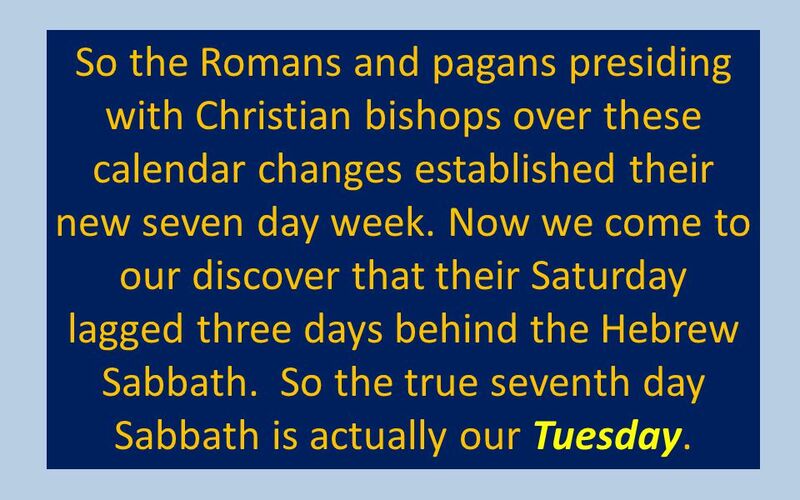 The Council of Nicaea pushed their seventh day Saturday back three days so the true seventh day Sabbath arrives three days late on our Tuesday. 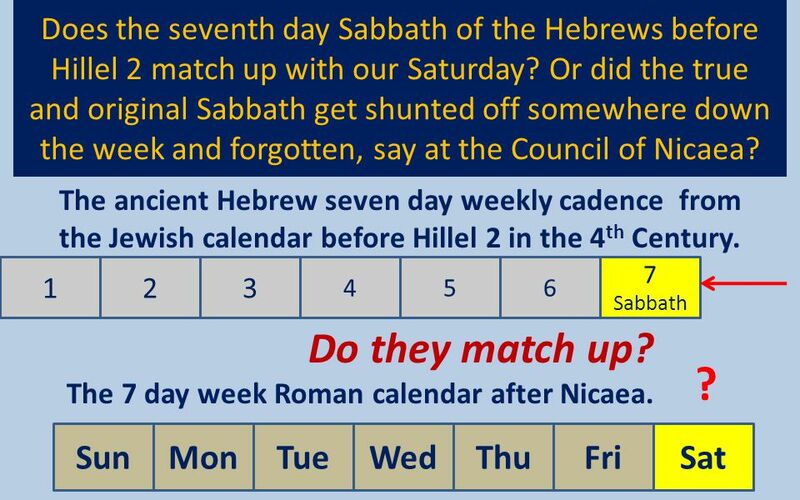 1 2 3 4 5 6 7 Sabbath The original pre-Hillel Hebrew Calendar Wed Thu Fri Sat Sun Mon Tues The seven day Nicene Julian Roman Perpetual calendar is four days out of synch with the Jewish calendar. 152 And when might we expect this to be corrected? The answer is simple. So what are we to do about this? 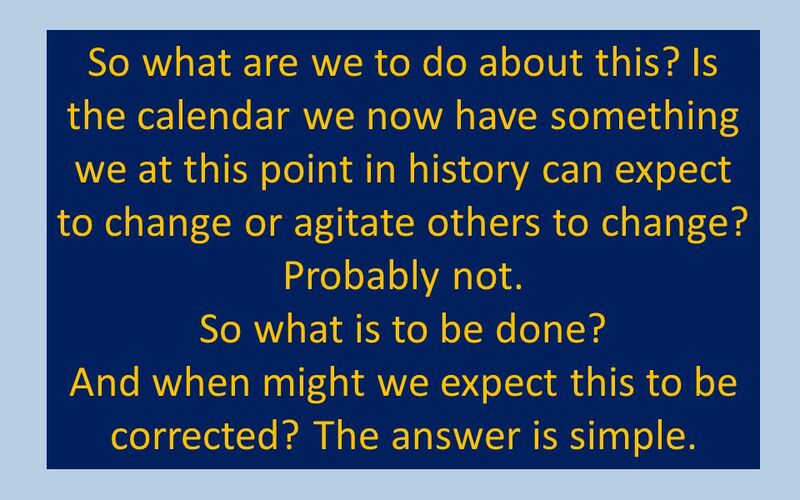 Is the calendar we now have something we at this point in history can expect to change or agitate others to change? Probably not. So what is to be done? And when might we expect this to be corrected? The answer is simple. 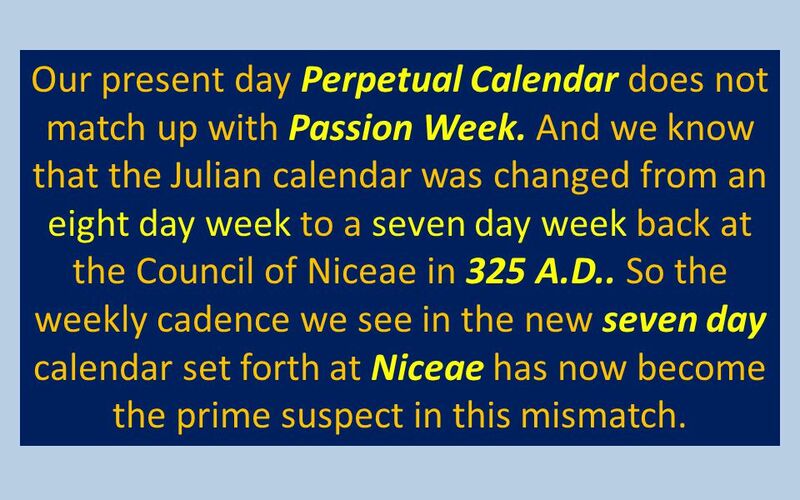 153 The 7 day week of our Roman/Perpetual calendar after Nicaea. 154 The Judeo-Christian people will continue to lose temporal power until the end of this age. 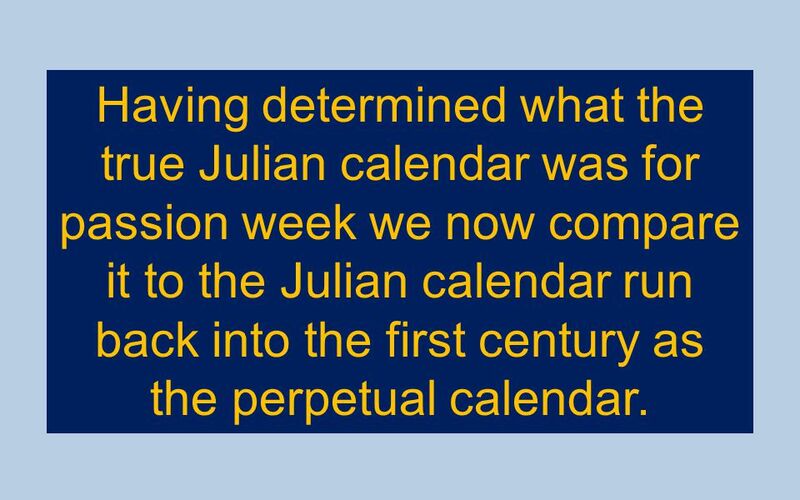 We may just have to wait and let Messiah fix the calendar. 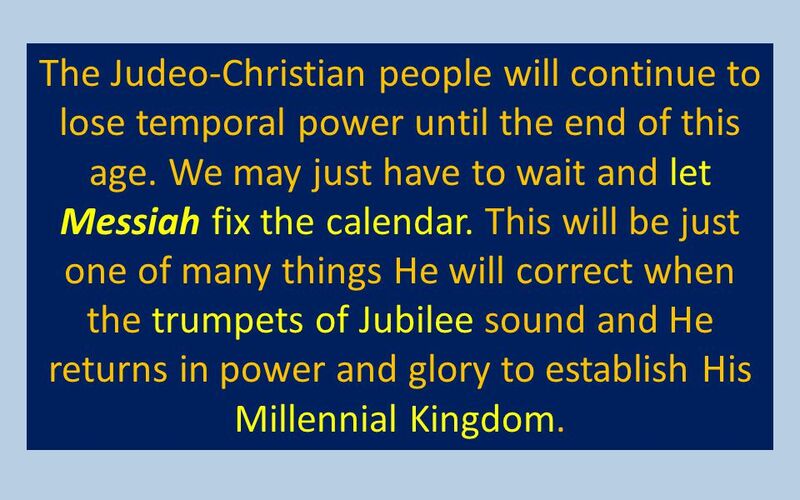 This will be just one of many things He will correct when the trumpets of Jubilee sound and He returns in power and glory to establish His Millennial Kingdom. 156 For all we know He may even reset the orbits of the earth and moon in the solar system to bring us back to a 360 day year and a 30 day month. 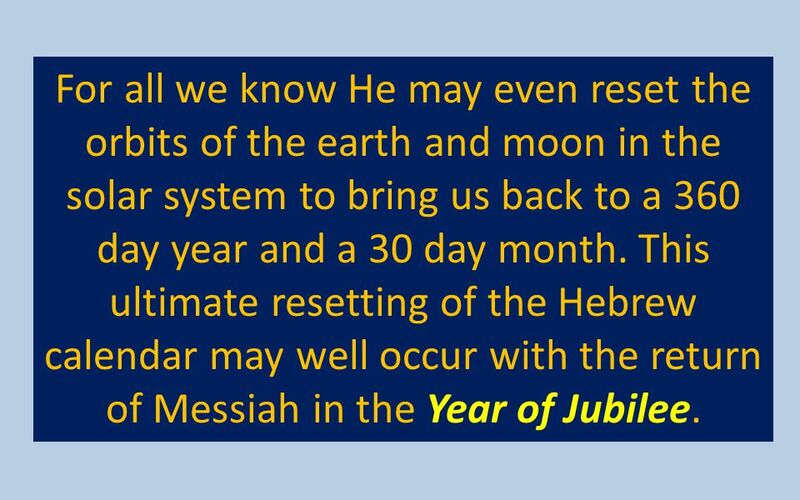 This ultimate resetting of the Hebrew calendar may well occur with the return of Messiah in the Year of Jubilee. 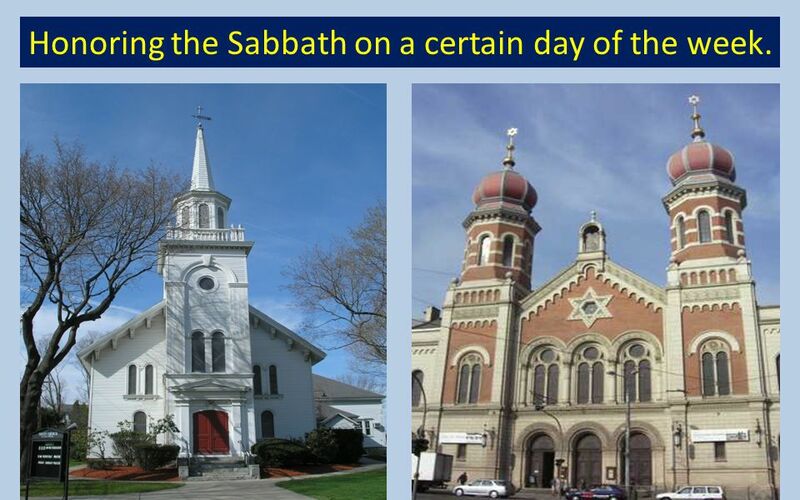 Download ppt "Remembering the Sabbath Day Is the Hebrew Sabbath really our Saturday?" Apologetics Session 1 – Intro and Prophecies about Jesus 1 But in your hearts set apart Christ as Lord. Always be prepared to give an answer to everyone. Galatians 4:4-5. The Birth of Jesus Most of world celebrating His birth Thursday, 25 th – Maybe they are correct about the date Convincing non-Catholic.